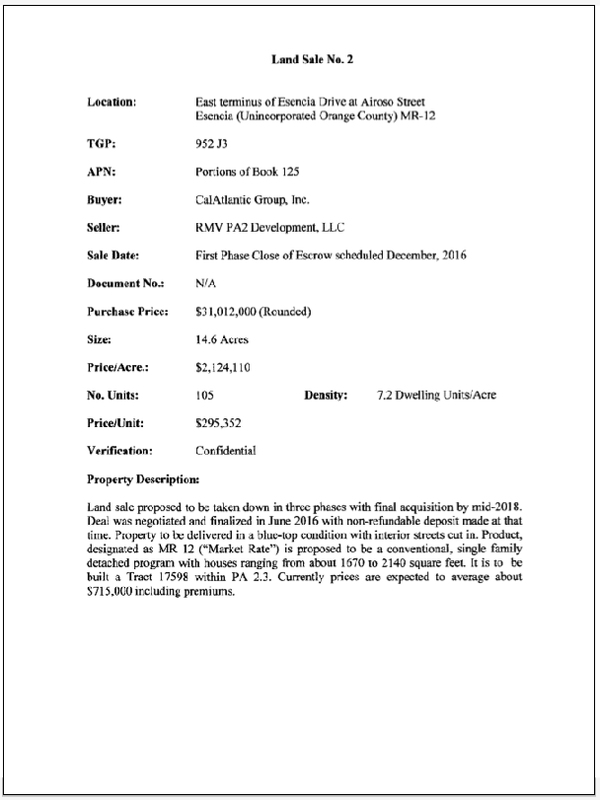 RE: Purchase and Sale of Real Property with the intent to defraud taxpayers living within the Capistrano Unified School District of $23 million dollars. On March 22, 2017 CUSD Trustees approved Resolution No. 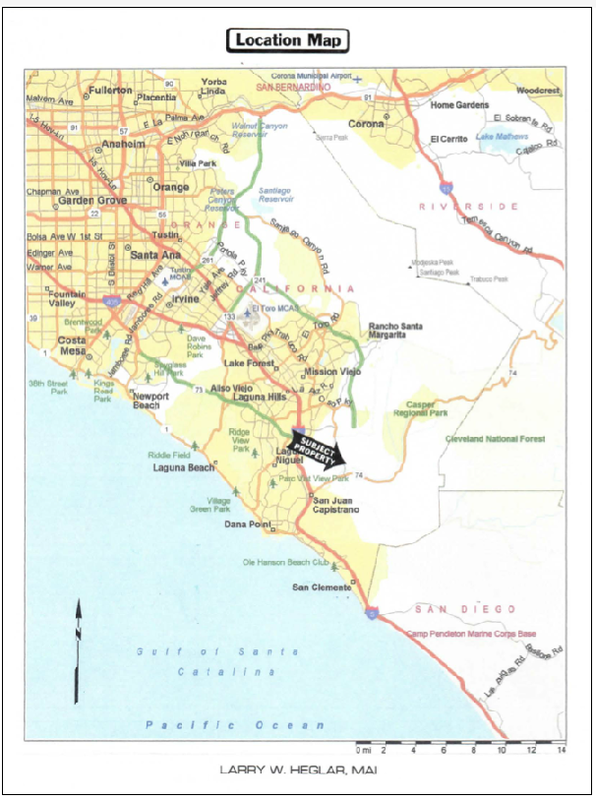 1617-56 “Ratification of Agreement to Purchase the Esencia School Site and Delegation to Accept The Deed which stated that CUSD was to purchase 14 acres of land for the Esencia K-8 School Site for $33.86 million dollars ($2.4 million per acre). This land has NO ENTITLEMENTS. The school site is 14 acres of dirt. 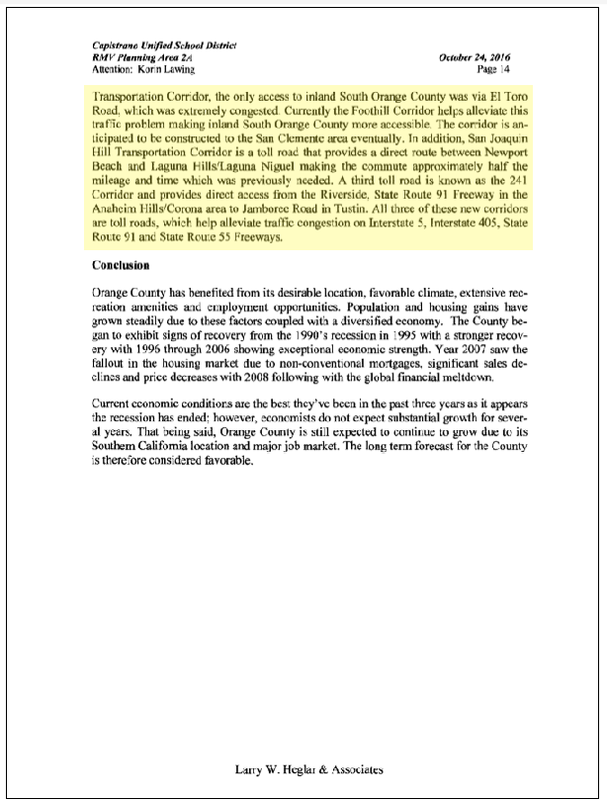 The appraisal was based on “Highest and Best Use” using a “Sales Comparison Approach”. 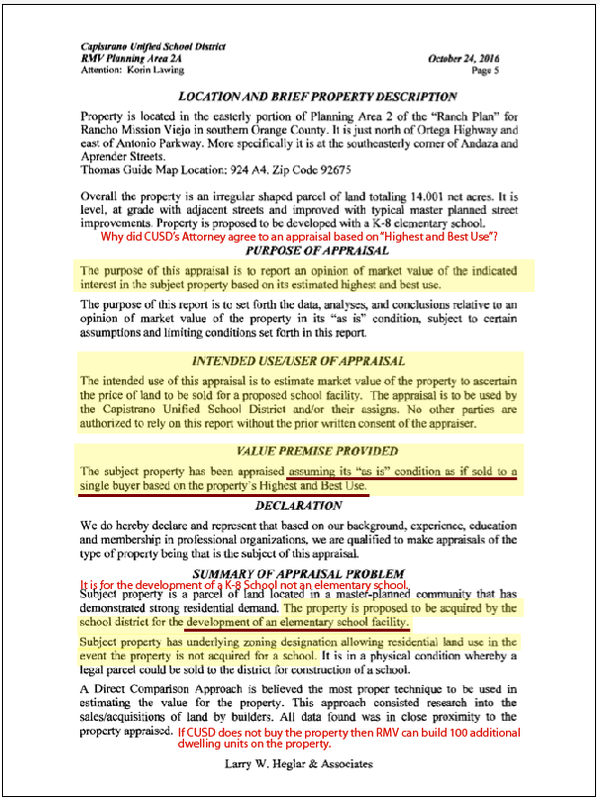 The intended use of this appraisal is to estimate market value of the property to ascertain the price of land to be sold for a proposed school facility. 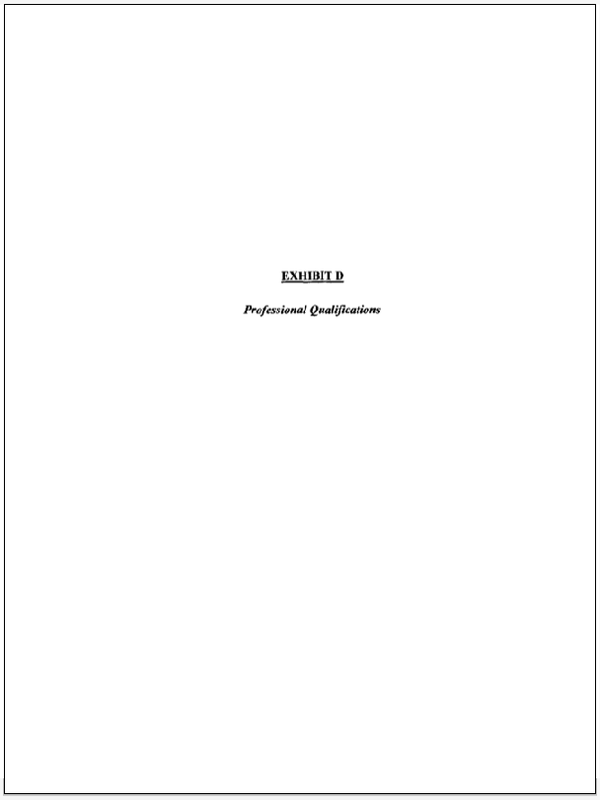 This appraisal report has been prepared in accordance with the Code of Ethics and Standards of Professional Practice (USPAP) of the Appraisal Foundation. 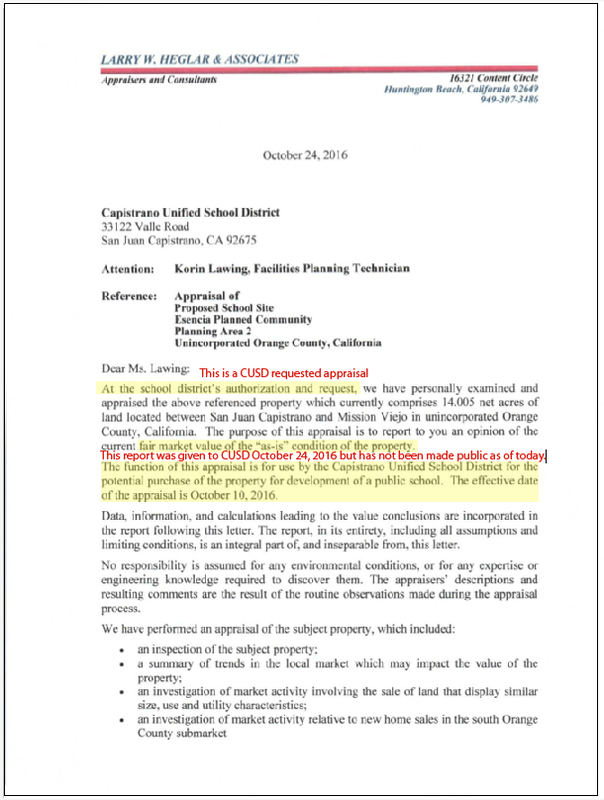 The Appraisal has been completed pursuant to requirements as detailed in the “School Facilities and Funding Agreement and Options to Purchase School Site” between Capistrano Unified School District and RMV Community Development, LLC, et al dated October 23, 2013. 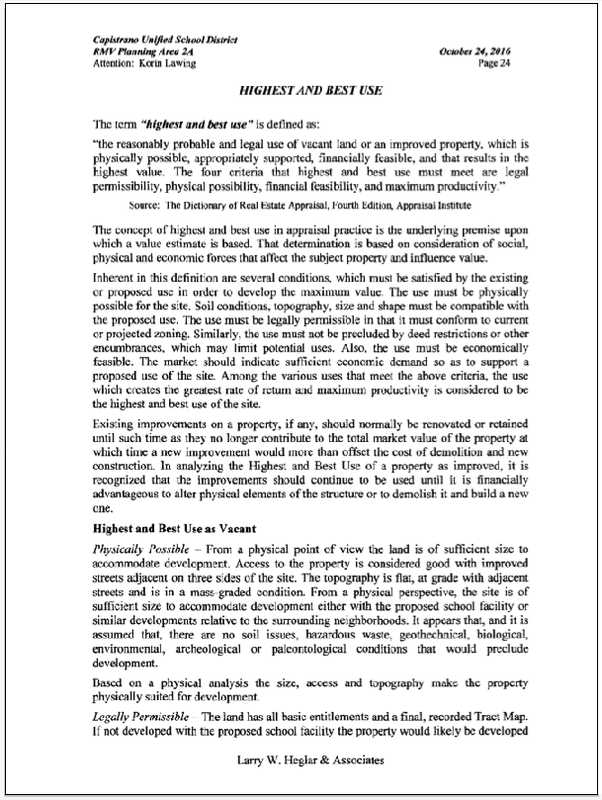 The reasonably probable and legal use of vacant land or improved property that is physically possible, appropriately supports, financially feasible, and results in the highest value. The four criteria the highest and best use must meet are legal permissibility, physical possibility, financial feasibility and maximum productivity. 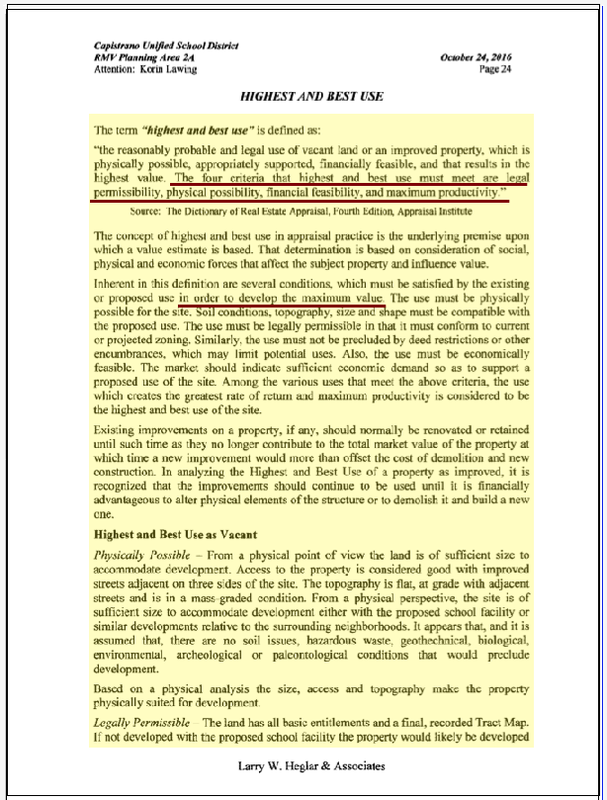 Alternatively, the probable use of land or improved property-specific with respect to the user and timing of the use- that is adequately supported and results in the highest present value. 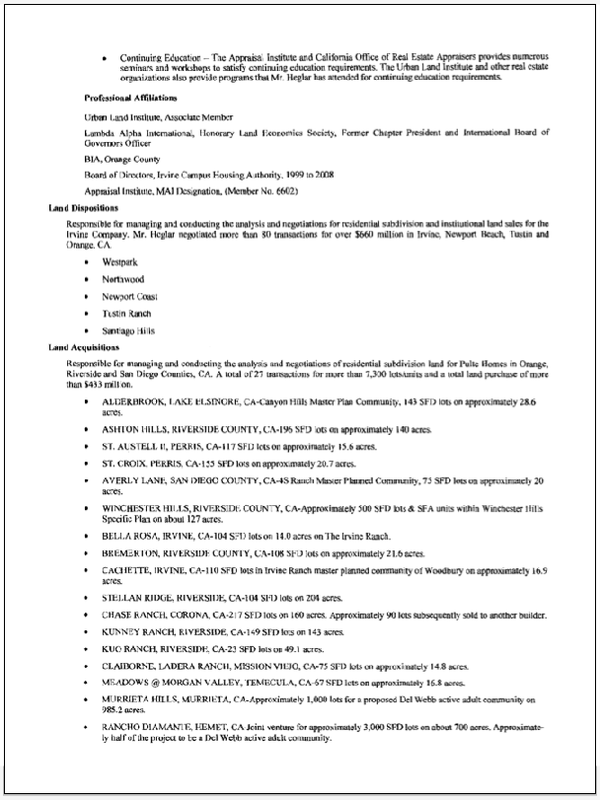 The Appraisal was performed in accordance with an engagement letter to Capistrano Unified School District dated May 18, 2016 and on Independent Contractor Master Agreement dated August 17, 2016. 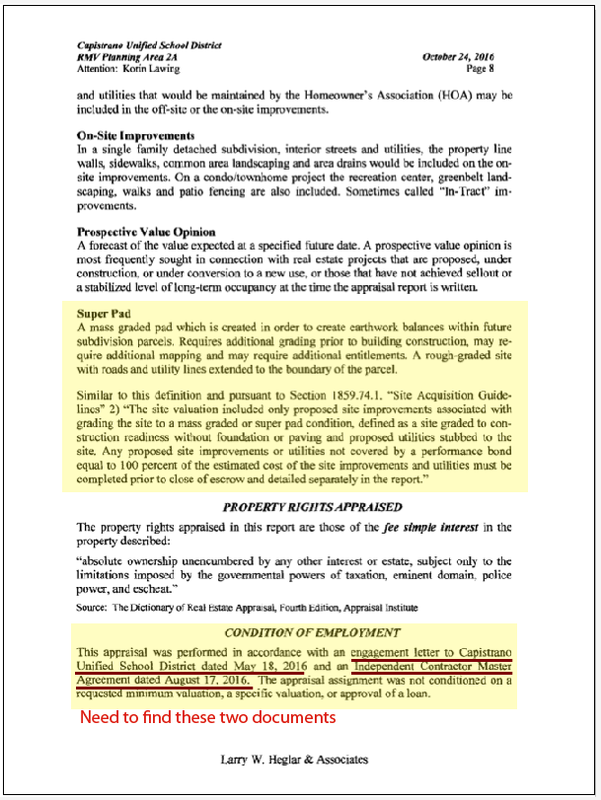 The appraisal contract assignment was not conditioned on a requested minimum valuation, a specific valuation, or approval of a loan. Subject property is unimproved as of the date of the value [dirt with NO Entitlements]. 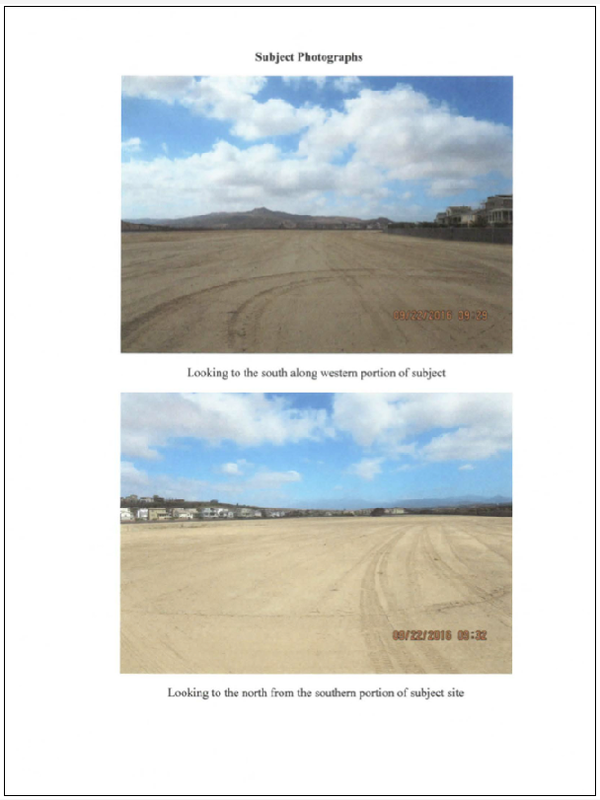 Based on discussions with staff members at Rancho Mission Viejo, and based on current market conditions, the company would anticipant that the subject site would accommodate approximately 100 dwelling units. 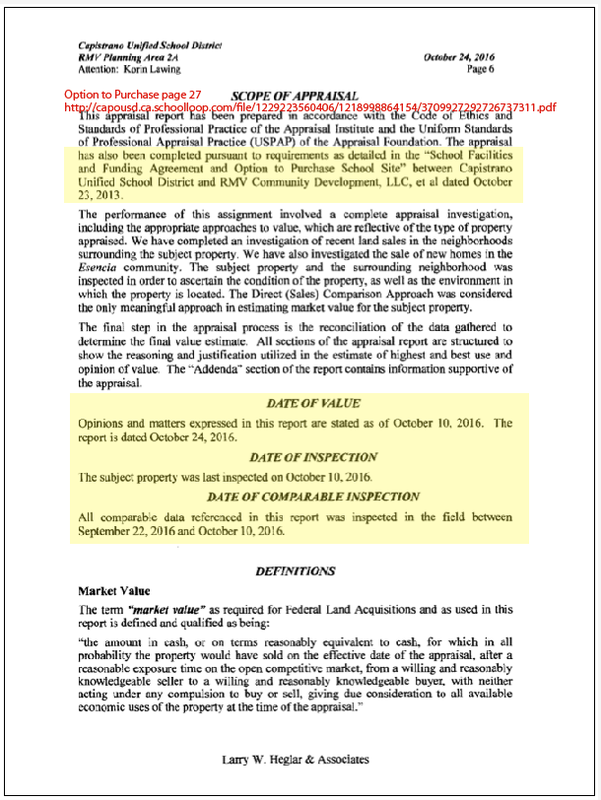 The Appraisal Date is October 2016 and it is using two comps that are not “sold” yet Nos. 1 and 2 (11/16 and 12/16). 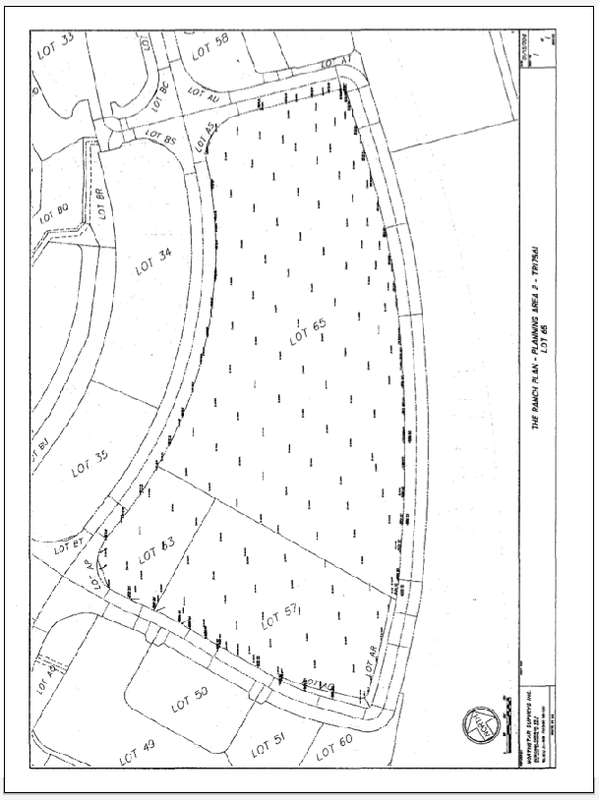 All public disclosure of the projected cost of the land was an estimated value of the 14 acres at $21 million which is in line with Sale Nos. 3, 4, 5, and 6. The Appraisal cost CUSD $6,500.00. 1) Superintendent Vital and District staff failed to provide trustees with the Appraisal in a timely manner. 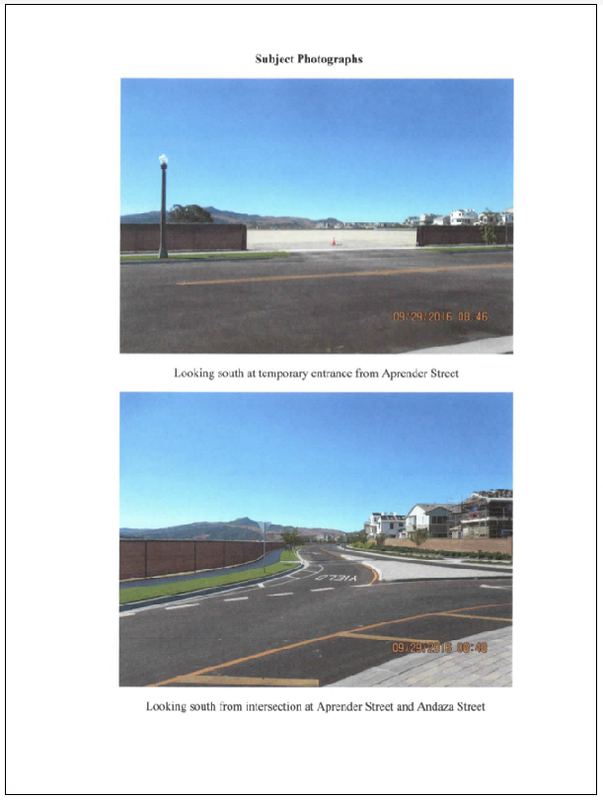 The Appraisal was completed in October 2016. Staff did not share the Appraisal with Trustees until the February 22, 2017 Board of Trustees meeting. If Staff had shared the Appraisal with Trustees in October, Trustees would have had sufficient time to question the change in price [from $21 million to $34 million], and request a second appraisal. This appraisal was shared with the Ranch, and was so high, the Ranch did not do it’s own appraisal. 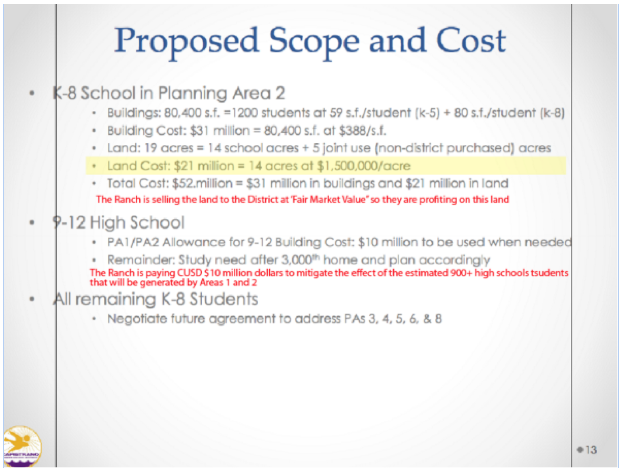 Every public disclosure of the proposed cost of the school site showed a projected cost of $21 million dollars ($1.5 million per acre). 2) Superintendent Vital and District staff placed Resolution No 1617-56, Ratification of Agreement to Purchase the Esencia School Site and Delegation to Accept the Deed on the February 22, 2017 BOT meeting as Agenda Item #10. The Item was placed on the CONSENT CALENDAR without listing the price CUSD was to pay for the site. 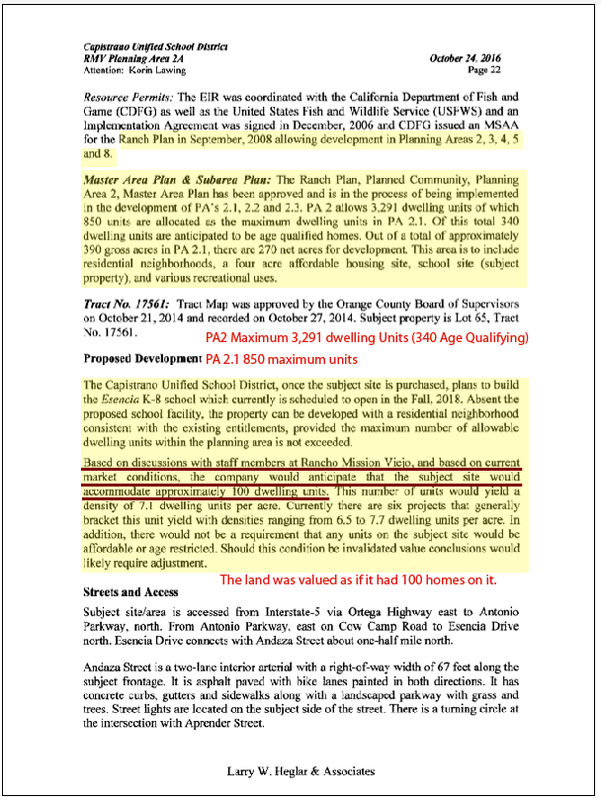 The original Agenda Item #10 was posted without stating how much CUSD was paying for the land. A request was sent to Clark Hampton, Deputy Superintendent, Business and Support Services asking that the Agenda Item be amended to reflect the cost of the land. 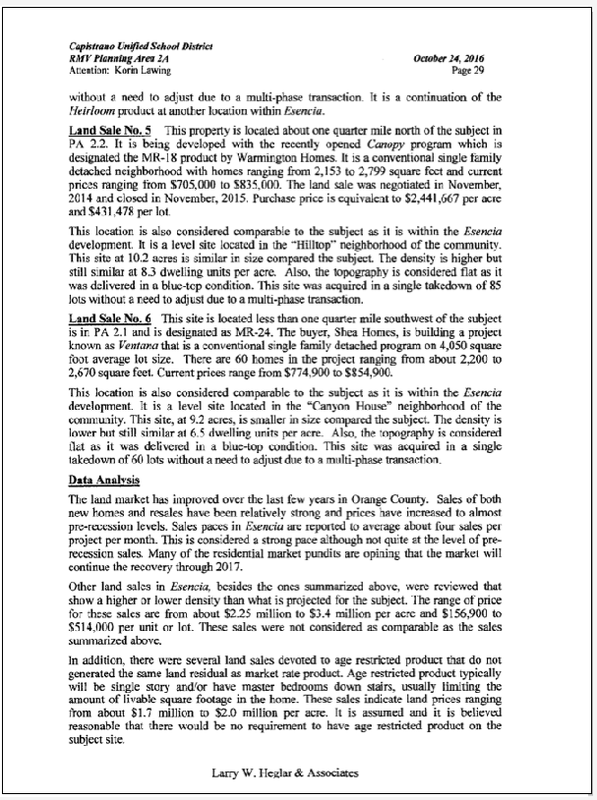 The Item was amended to reflect a cost of $33,860 ($2.4 million per acre). 3) On January 19, 2017, (3 days prior to the February 22, 2017 board meeting), Clark Hampton, Deputy Superintendent of Business and Support Services executed the Agreement for the Purchase and Sale of Escrow Instructions for Planning Area 2 School Site WITHOUT BOARD APPROVAL. It also appears that Clark Hampton did so without legal review. The signature page shows that the attorney signed their name with an "X", and a signature that is not legible. 4) Taxpayers had to spend a great deal of time and energy to get answers to questions regarding why the price had changed so dramatically. CUSD and the County of Orange Planning Department put roadblocks up at every point. At the February 22, 2017 Board of Trustees Meeting Agenda Item #10, Trustees were asked to approve RESOLUTION NO. 1617-56, Ratification of Agreement to Purchase the Esencia School Site and Delegation to Accept the Deed. In advance of the meeting the Public expressed concerns over missing material terms, like the price of the land. 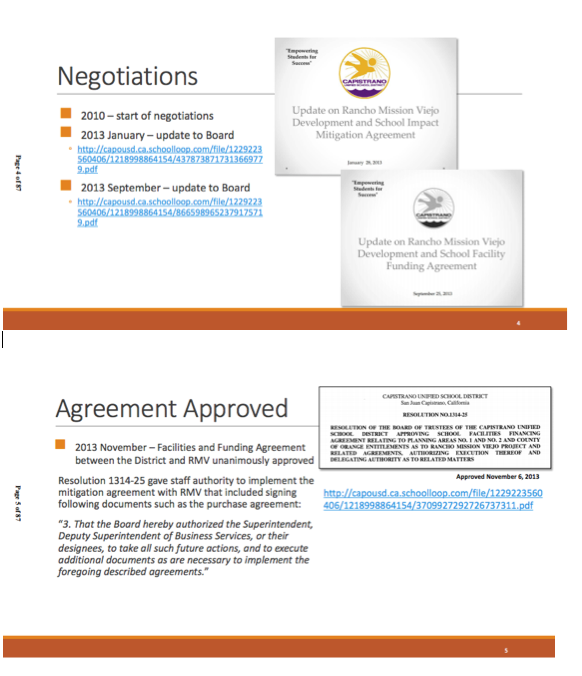 When Staff amended the agenda Item to reflect a cost of $34 million ($2.4 million per acre), the Public asked to see the three (3) appraisals to see why the cost had gone from $21 million ($1.5 million per acre) to $34 million ($2.4 million per acre). Clark Hampton responded that the Appraisal was not discoverable under the Public Records Act until AFTER the land was purchased. The Public attained a Copy of the Appraisal though other means. Public outcry heightened. CUSD announced that it would hear the matter in a Special Board workshop on March 15, 2017. Members of the Public complained that a Board Workshop was NOT the proper venue for this matter because CUSD has a policy of not recording Board Workshops and Board Workshops limit Public in-put. As a result of complaints from the Public, CUSD announced that it would discuss the matter in a Special Closed Session meeting at the February 22, 2017 BOT meeting. THE SPECIAL MEETING WAS CALLED BECAUSE CLARK HAMPTON EXECUTED AN AGREEMENT TO PURCHASE THE ESENCIA SCHOOL SITE FOR $34 MILLION DOLLARS WITHOUT BOARD APPROVAL WHEN ALL PRIOR DISCLOSURES REFLECTED A PRICE OF $21 MILLION. 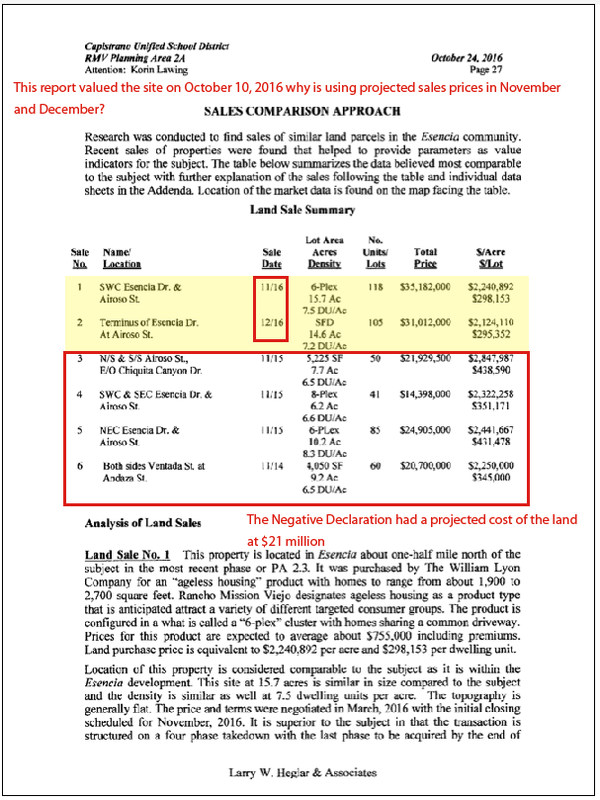 ACTUAL FAIR MARKET VALUE SHOWS THE LAND SHOULD HAVE BEEN PRICED CLOSER TO $11 MILLION. THIS MATTER WILL BE DISCUSSED AT A SPECIAL BOARD MEETING MARCH 15, 2017. NOTE: CUSD has cut the beginning of the audio for the Special Closed Session Meeting. Trustee Jim Reardon was not present for this meeting and was suppose to teleconference into the meeting. CUSD staff failed to do that for the Public Comments Portion of this meeting. The board audio starts with Public Comment without any indication as to what Item the comment is for. 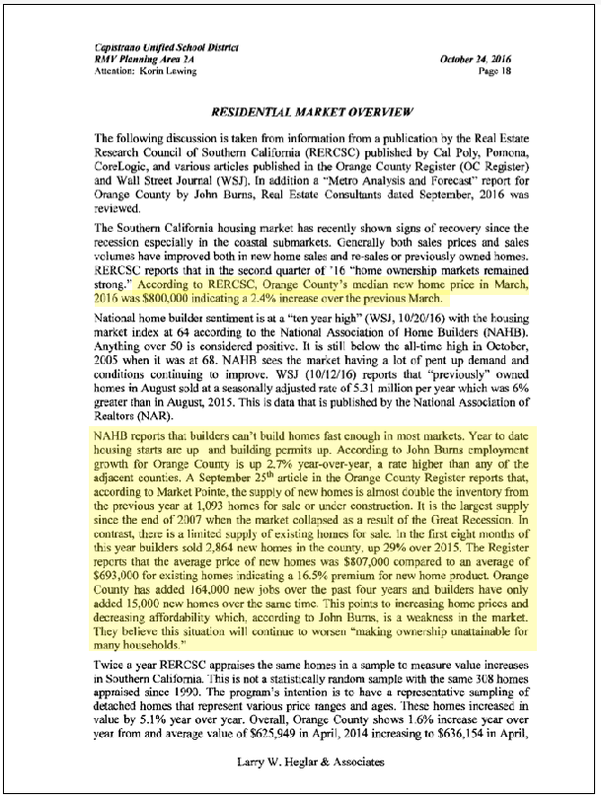 at 0:00 The Ranch may have built 1,600 more homes than anticipated in the 2013 ERI. 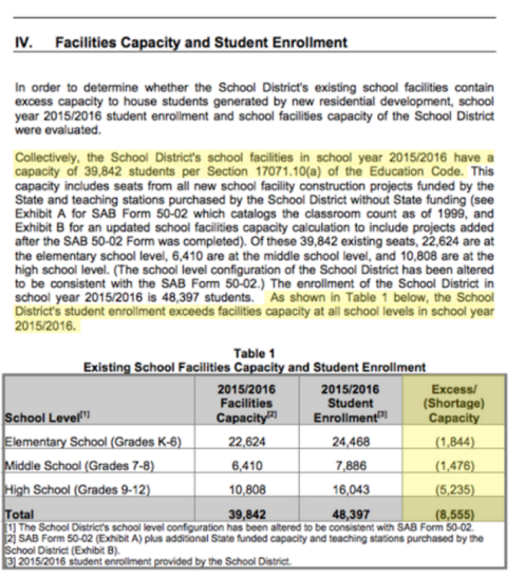 at 0:35 March 2016 Capacity study shows that CUSD is 8,555 students over legal capacity (excluding any ranch students). at 0:54 Regarding the Appraisal - It was based on "Highest and Best Use". 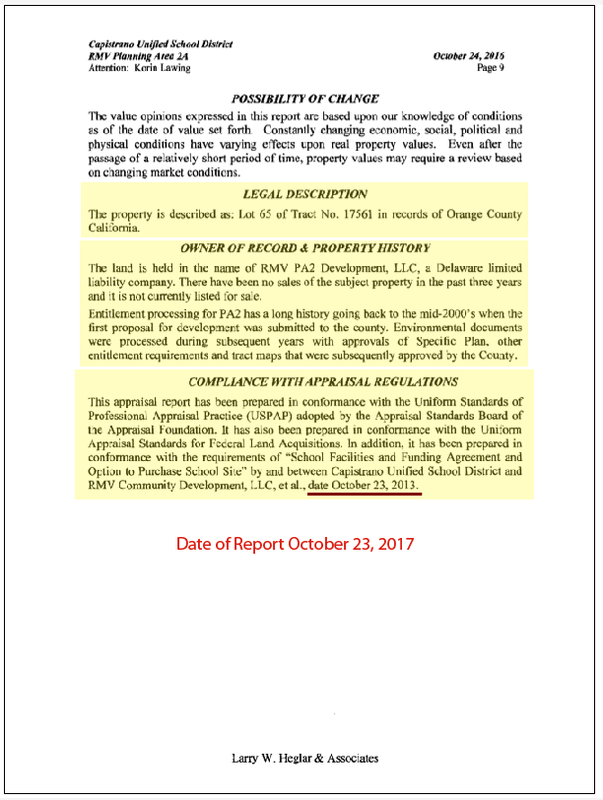 It was completed in October 2016 and staff did not show it to Trustee until this week. at 1:15 There are no entitlements included in this land and the property should not have been valued as if it had 100 houses on it. dedicated just to this item. Because it is a Special Board meeting, it will be recorded and it will provide for Public comment. During Oral Communications, Student and Taxpayer Advocate, Dawn Urbanek addressed the Board in Oral Communications. at 34:49 RMV has sped up its construction timeline and has added 1,600 additional units to Sendero and Esencia. These units are not included in CUSD’s student generation rates, a thousand students may not have a seat at a CUSD school this fall. at 35:03 The Public is trying to get an actual count on how many extra permits have been issued. at 35:22 CUSD has a very serious problem- you have a Staff member that entered into a $34 million dollar contract WITHOUT BOARD APPROVAL. That is cause for termination and I hope Clark Hampton will be fired for cause. at 35:36 Staff has had the Appraisal since October 2016, and CHOSE NOT to share the information withTrustees until the February Board meeting. 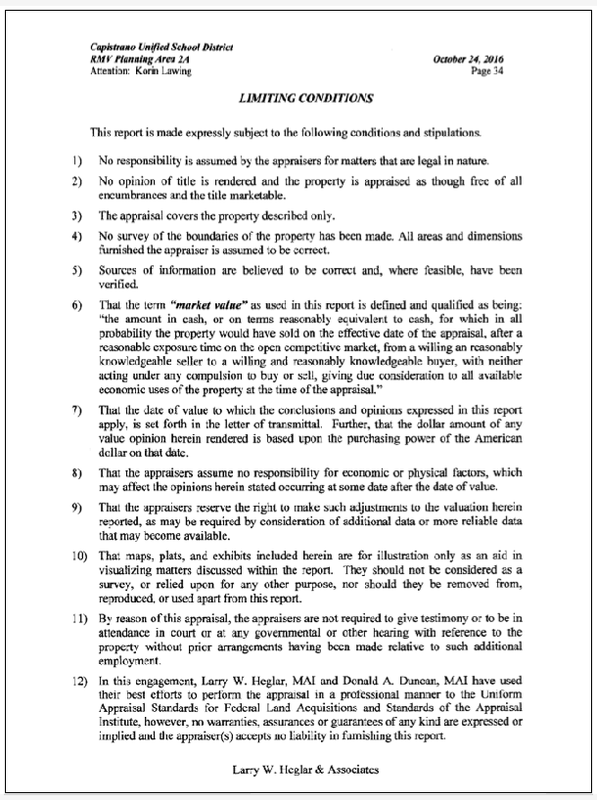 at 35:45 The Appraisal is defective because it values the land as if 100 homes are built on the property. It is a dirt lot with NO ENTITLEMENTS. at 36:34 Trustee McNicholas states that this Item was pulled by Staff and removed from todays Agenda and will be heard at a Special Board Workshop on March 15, 2017.
at 0:26 I came to remind Trustees that you are elected by the people to represent students and taxpayers in all matters before the Board. Any Trustee who votes to approve this contract knowing that Staff has had the Appraisal since October and did not share it with you; put it on the Consent Calendar without a price, is in breach of their fiduciary duty to taxpayers and students. at 1:36 Overpaying for the land by $24 million dollars and wasting taxpayer money is aggregious. 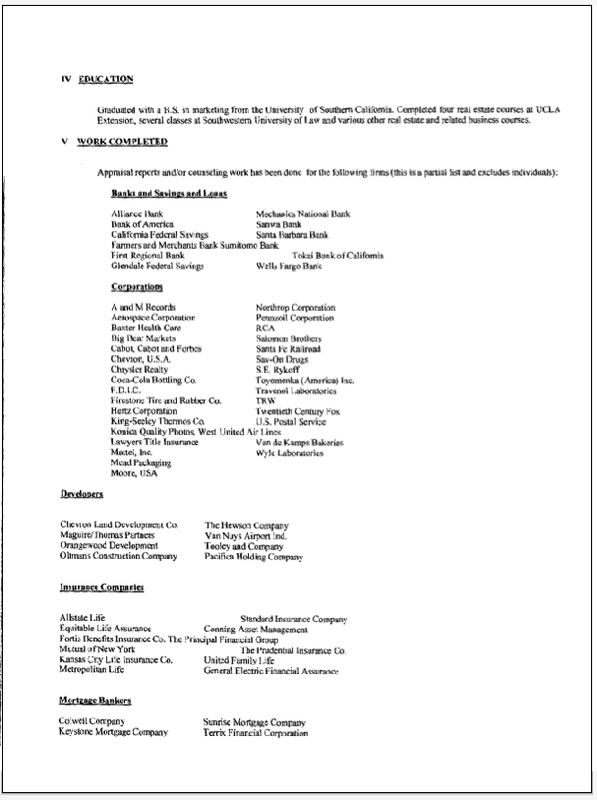 at 1:40 If this was a private sector company, Kristen Vital and Clark Hampton would no longer have their jobs. at 1:50 I hope you take this very seriously and stop wasting taxpayer money because CUSD just cut $6 million from books and supplies to balance its second interim budget. 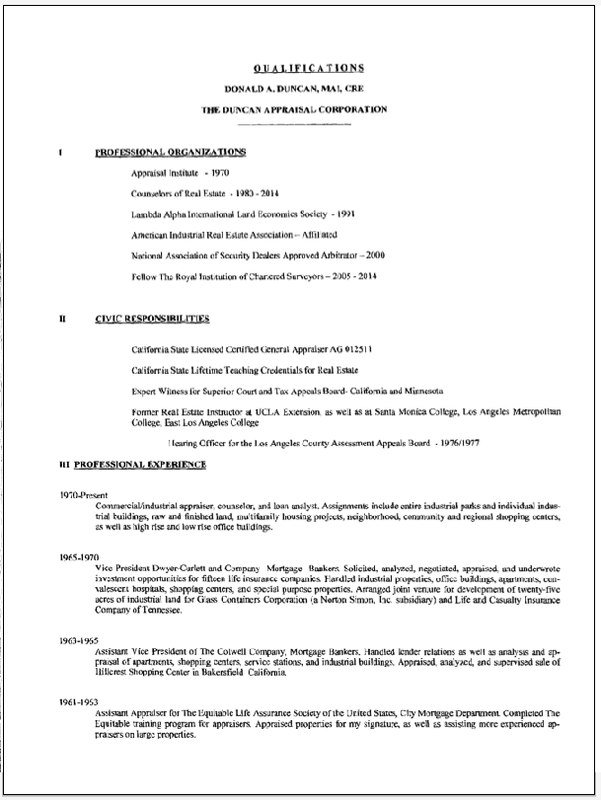 at 2:07 There was suppose to be a second item on the agenda – Contract with AW Industries - $626,450 contract to an individual for inspection services for Esencia K-8 School. I was cut off and admonished for speaking on the AW Industries Contract. at 5:11 Report Out from Closed Session – Trustees voted 5-0-2 voted to continue this Item to the March 22, 2017 Board Meeting. They did not even do the Presentation for this Item. Report out from closed session stated that CUSD was going to get two new appraisals. Members of the Public - Dawn Urbanek, Laura Ferguson, Julie Collier and Wendy Shrove thought that this meant that the Resolution would not be approved until after the appraisals were received. However, when the item was actually discussed Trustees ratified the agreement to purchase the land for the price of $33.86 million, and said that the Contract would be amended per an MOU, which was not disclosed to the Public. was not on the Agenda on Wednesday March 22, 2017. 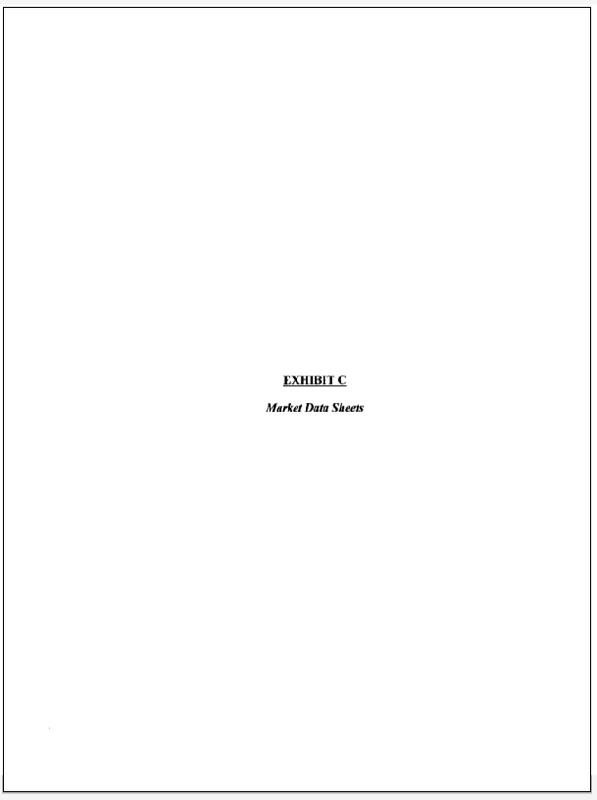 The Public was never given an opportunity to view and comment on this document. The Board audio will show that Superintendent Kristen Vital clearly states that the MOU will be posted by tomorrow. Patricia Holloway (Clerk of the Board) was not present at the meeting. President of the Board Trustee McNicholas appointed Kristen Vital as the substitute clerk. Superintendent Vital signed some documents, picked up an overnight bag and walked out of the meeting at 7:56. CUSD did not state on the record that she had left the meeting. A short time after Superintendent Vital’s departure, Trustee Pritchard asked if it was appropriate for Superintendent Vital to be the substitute- it needed to be a Trustee. The meeting continued after a brief discussion. 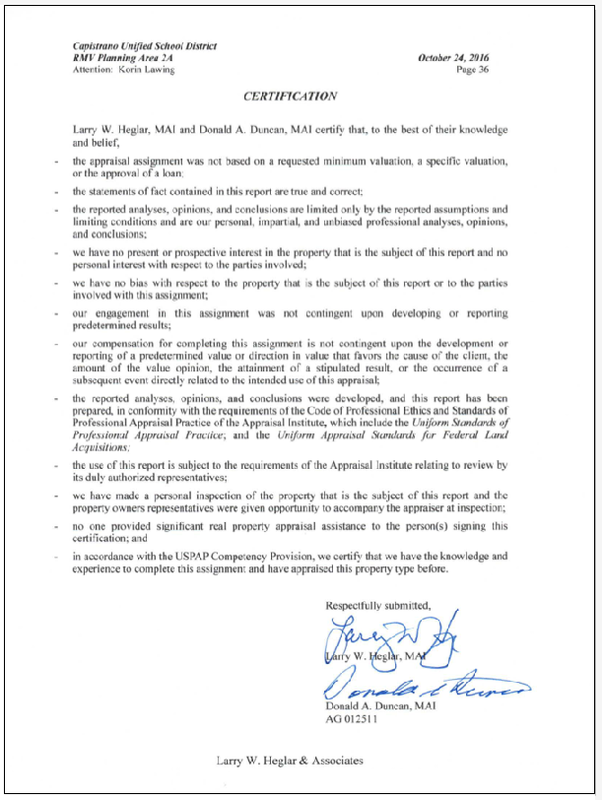 A short after that, Clark Hampton requested that a Trustee “co-sign” the document. 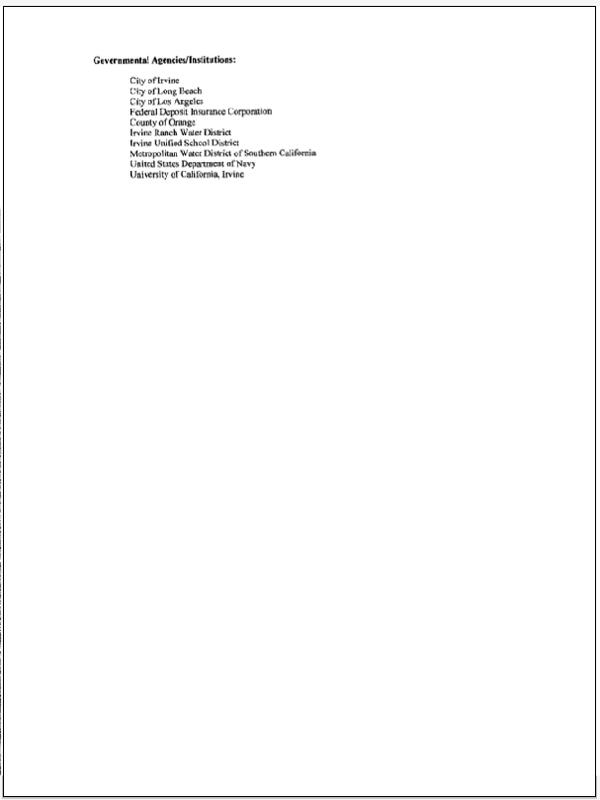 The Signature page has no Attorneys for CUSD on this document. Kristen Vital signed the document at the meeting as a “Substitute” for Patricia Holloway (Clerk of the Board). Jim Reardon was suppose to “Co-sign”. Who signed this document? Friday Night March 24, 2017 Taxpayer Advocate Kim Sprague sent Clark Hampton an e-mail asking what this all meant. 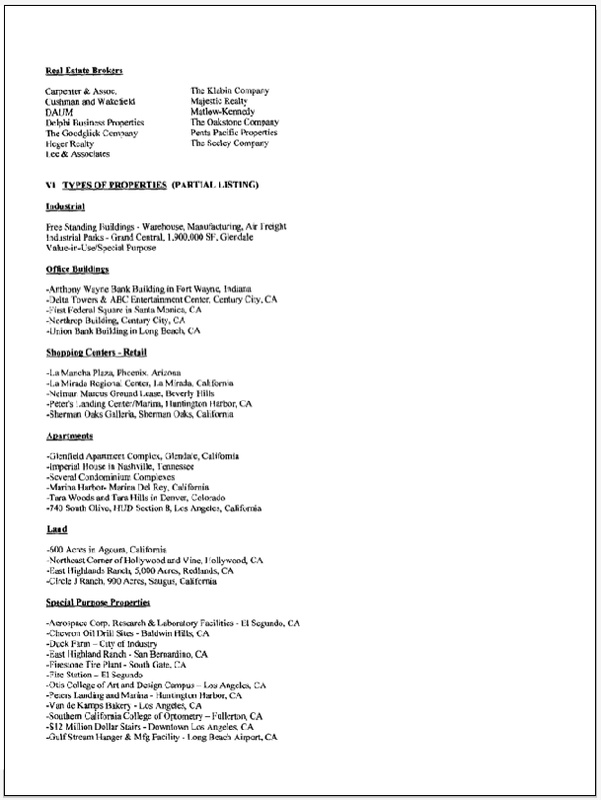 The MOU is very troubling especially if CUSD did not have an attorney review the document. 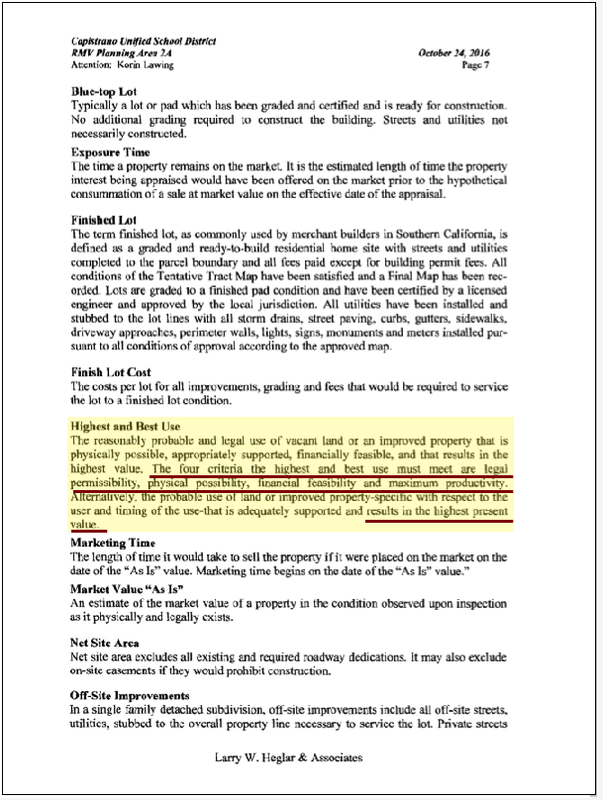 Why does the Developer get to approve the Appraisers? 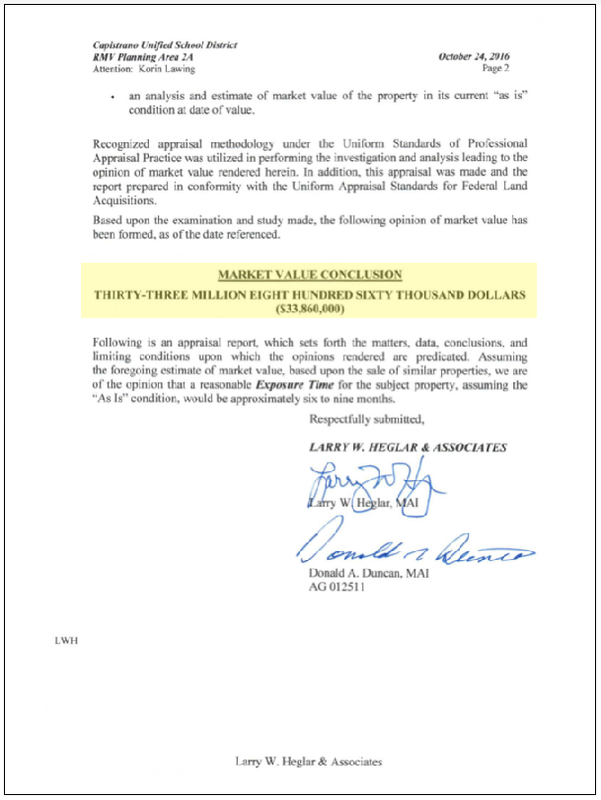 If the Second Appraisal average differs by less than 10% from the First Appraisal, or if the Second Appraisal Average is greater that the First Appraisal, then no adjustment shall be made to the purchase price? SO CUSD pays $34 million for this land and if there is a refund it goes to the CFD and the State? 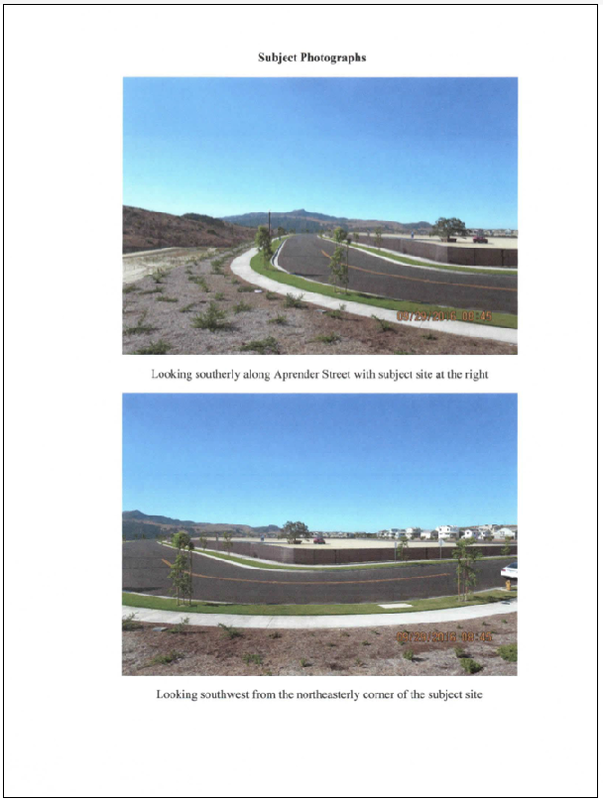 The proposed scope and cost of the land for Escencia was always projected to be $21 million for 14 acres - $1.5 million per acre. Agenda Item #10 RESOLUTION to approve the purchase was presented to Trustees and the Public without a Price. 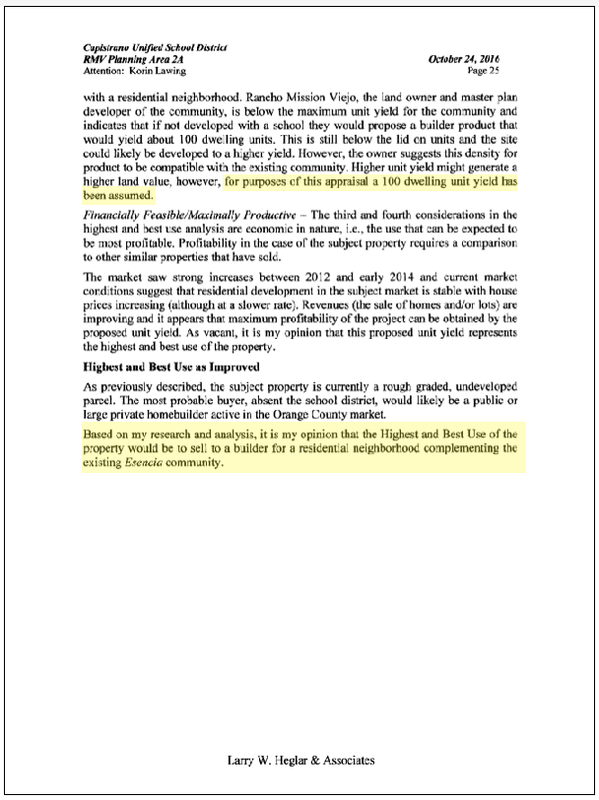 Members of the Public Requested that the Agenda Item be amended to reflect the purchase price of the land. There is only one Appraisal of this land. 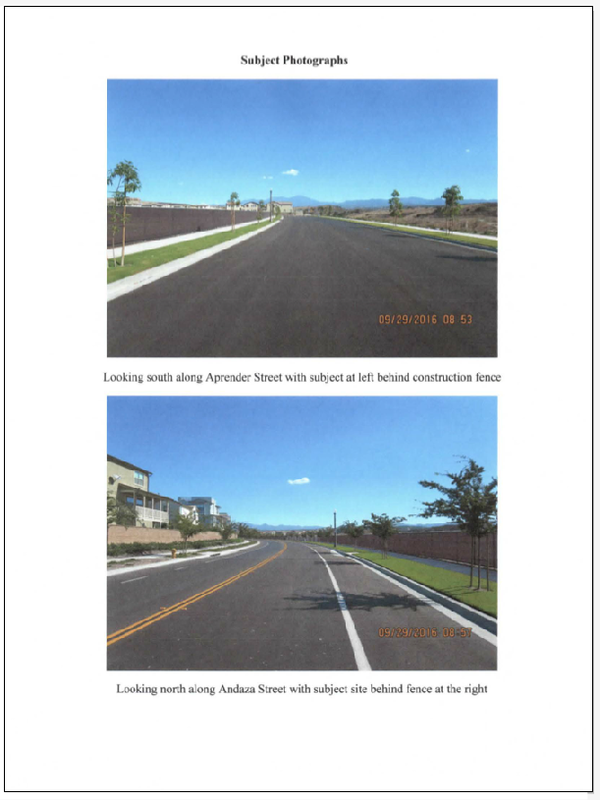 The appraisal was requested by CUSD, and was completed on October 10, 2016. 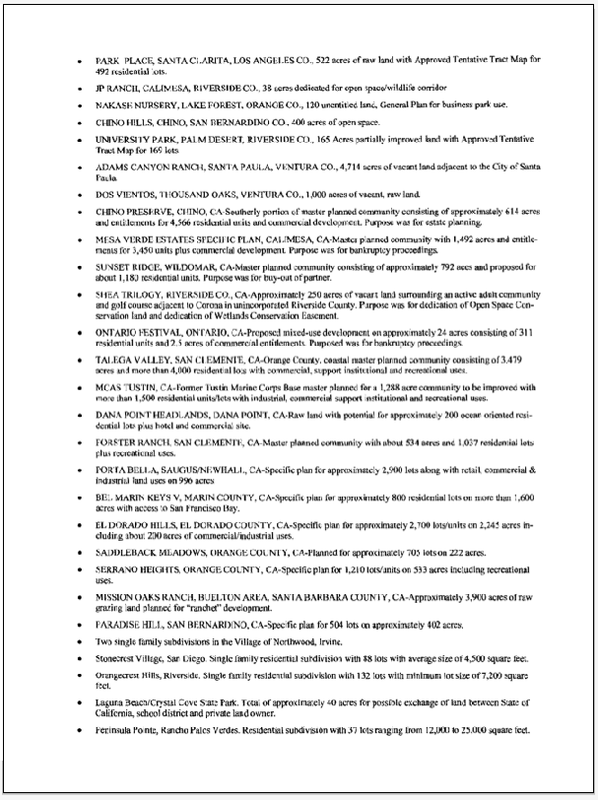 Staff received the Appraisal October 24, 2016. 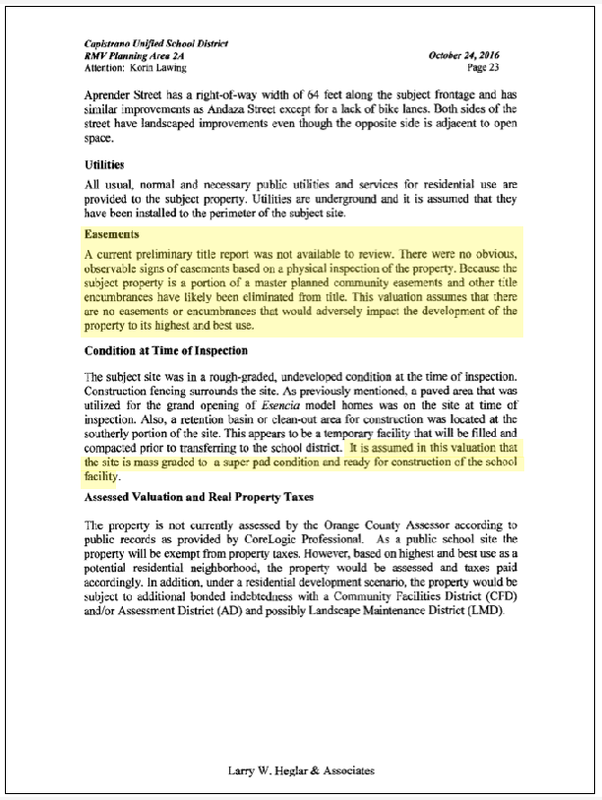 Staff did not share the Appraisal with Trustees upon receipt. Instead Staff waited until February 10, 2017 in preparation for the February 22, 2017 board meeting. Staff did not provide Trustees with an opportunity to review the proposal prior to this Board Meeting. Had staff shared the Appraisal with Trustees in a timely manner, Trustees would have had the opportunity to seek a secondary appraisal correcting material defects within the October 2016 Appraisal. 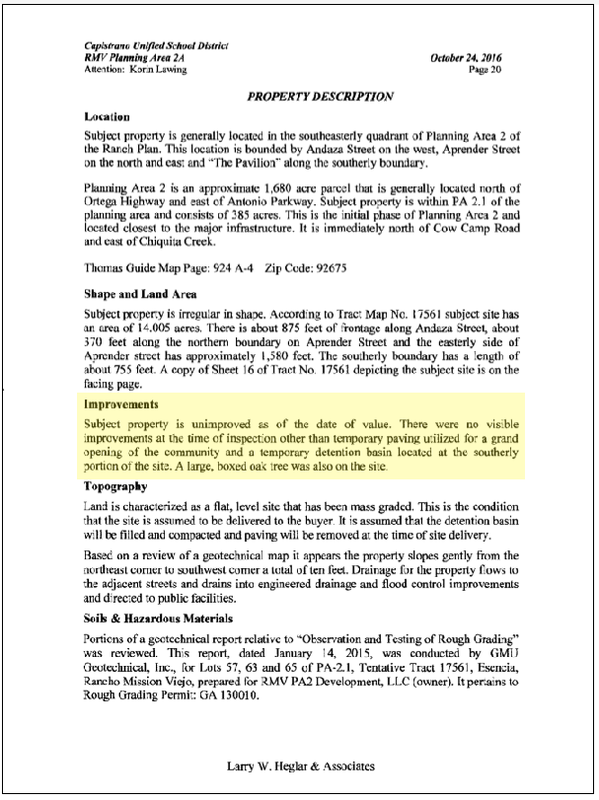 The Appraisal was based on "highest and best use” - the Appraiser valued this vacant lot (with NO ENTITLEMENTS) as if it had 100 dwelling units on it. The empty lot contains no entitlements, and in fact the Ranch maintained the right to build these 100 homes in other parcels in RMV. 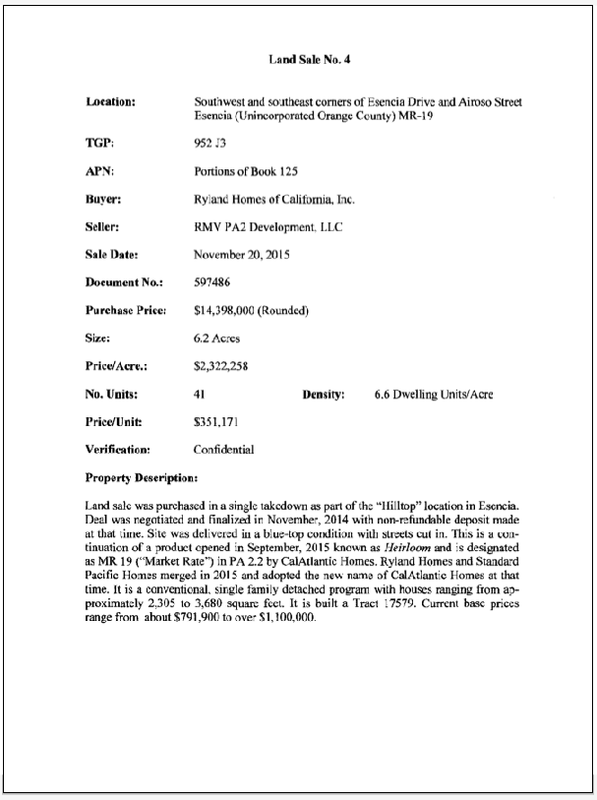 on page 27 of the Appraisal it shows that the valuation is based on 6 sales. 4 of the sales closed in 2015 and showed valuations closer to the $21 million dollar figure. 2 Sales closer to the $34 million dollar figure were pending or future sales. 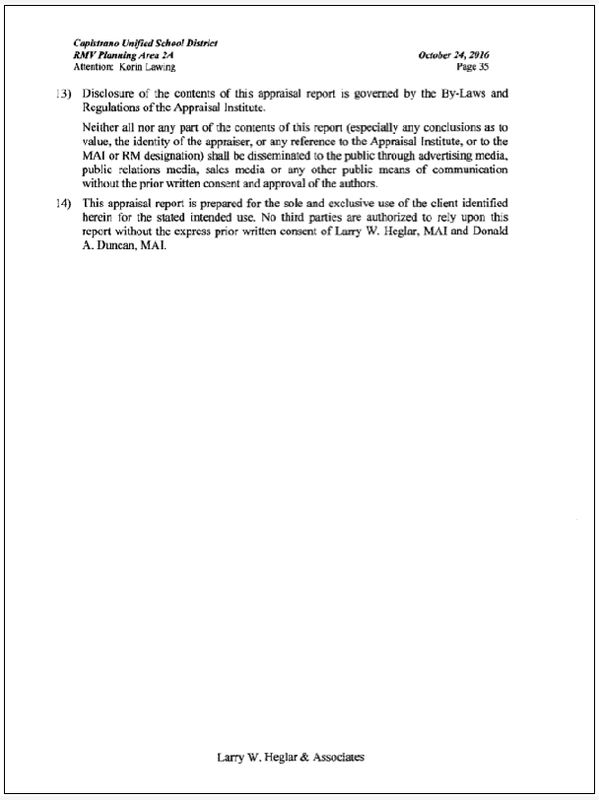 The Agreement for Purchase and Sale and Escrow PA2 School Site was executed by Clark Hampton on January 19, 2017 and was done so WITHOUT BOARD APPROVAL and WITH THE INTENT TO DECEIVE THE PUBLIC; AND TRUSTEES, WHO WERE ELECTED TO REPRESENT THE INTERESTS OF TAXPAYERS IN ALL MATTERS BEFORE THE BOARD. The Attorney for CUSD signed his name with an X and a scribble, which is not identifiable. The People feel that this Agreement was entered into with the intent to defraud the public, and a complaint has been filed with the District Attorney. Kristen Vital and Clark Hampton are listed as the Agency Negotiators for this purchase. 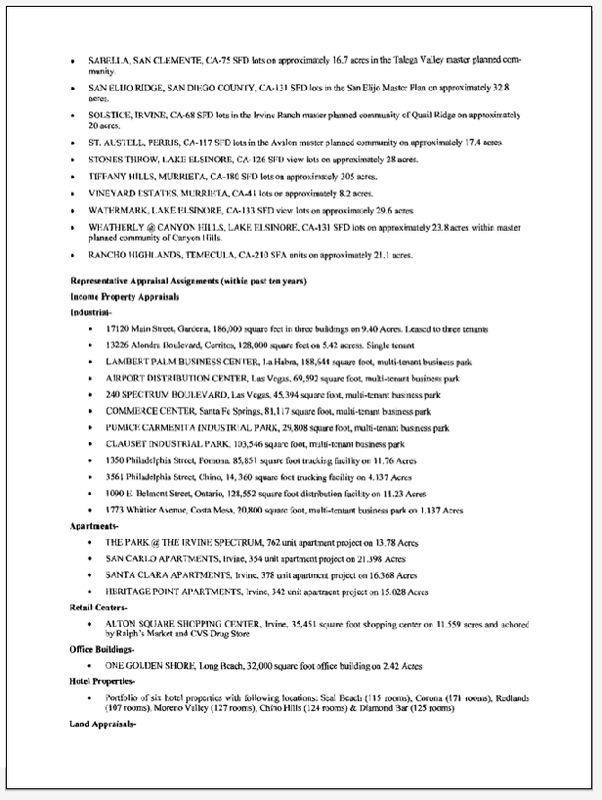 Neither Clark Hampton nor Kristen Vital are licensed real-estate brokers, and are not qualified to negotiate this deal. Attorney Stan Barankiewicz works for the law firm Orbach, Huff, Suarez and Henderson who are also handling the Conflict of Interest case against Trustee Hatton-Hodson. The Attorney Fees paid to this firm were increased from $100,000 to $300,000 at the February 22, 2017 BOT Meeting. The original agreement was for 19 Acres of land, 4 joint use (15 school acres). The Negative Declaration states that their should be 20 acres of land 4 joint use (16 school acres). 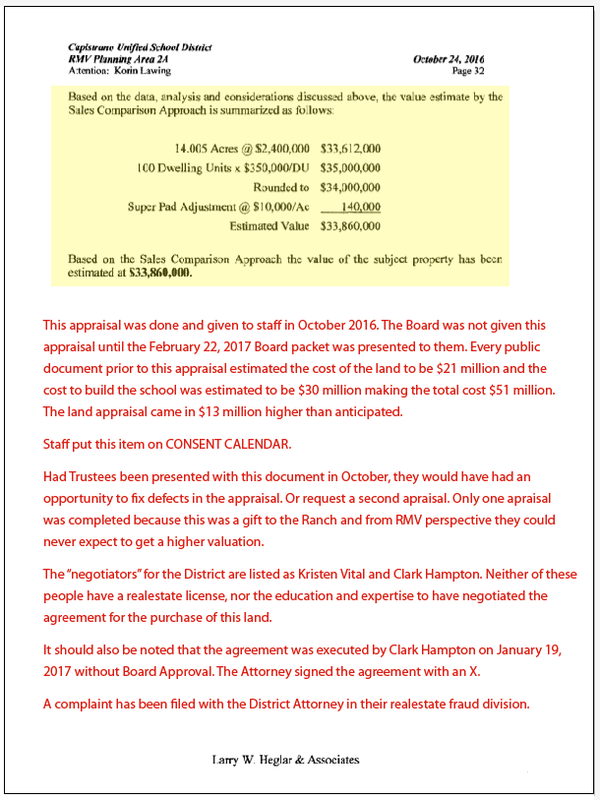 The February 22, 2017 Board Resolution is stating that CUSD is purchasing 14 acres of land - 4 joint use which would be a total of 18 acres of land? 5) The March 22, 2017 BOT Meeting- Evidence of CUSD’s attempt to defraud the public out of $24 million dollars. DAMAGES – The Public has been substantially harmed as a result of the Conduct of CUSD. 1) $24 million in taxpayer money is being taken- money that could be used to restore class sizes, restore programs like art, music and science and to fix and maintain facilities. 2) CUSD is 8,555 students over legal capacity (excluding any students from the Ranch). 4) Student generation rates are not accurate. The Ranch has sped up its timeline and has built what the Public believes to be 1,406 more units than initially planned. There could be over 1,000 students that will NOT have seats in CUSD schools for this fall September 2017-18. The Public is trying to verify this number, but the County is not cooperating. 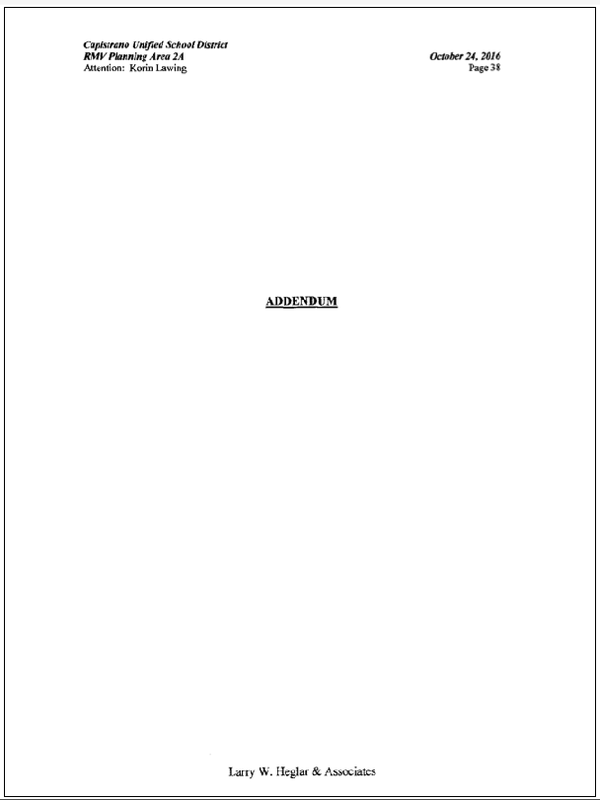 Source: http://capousd.ca.schoolloop.com/file/1229223560406/1218998864154/3709927292726737311.pdf pages 58 - 65.
at 77:56 Staff recommends that Trustees approve the purchase and sale agreement with the understanding that Escrow will close March 27, 2017 and that per an emergency MOU, 2 new appraisals will be done AFTER close of Escrow. Very happy that the Ranch and CUSD could find a path for continuing forward. Many Esencia residents are looking forward to the opening of their new school. Home owner Esencia. Purchased their home specifically for the close proximity to the Esencia K-8 school. He wants his children to walk to school. CUSD is the lead agency and announced that the school would be open August 2018. Please approve this land purchase and lets get this school open. 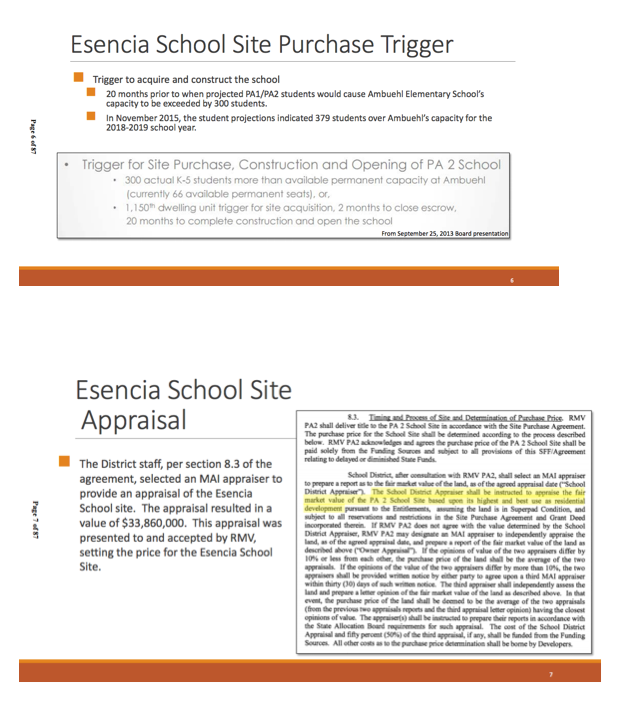 In all previous documents disclosed to the Public, the price of the land for Escencia K-8 School Site was projected to be $21 million for 14 acres - $1.5 million per acre. 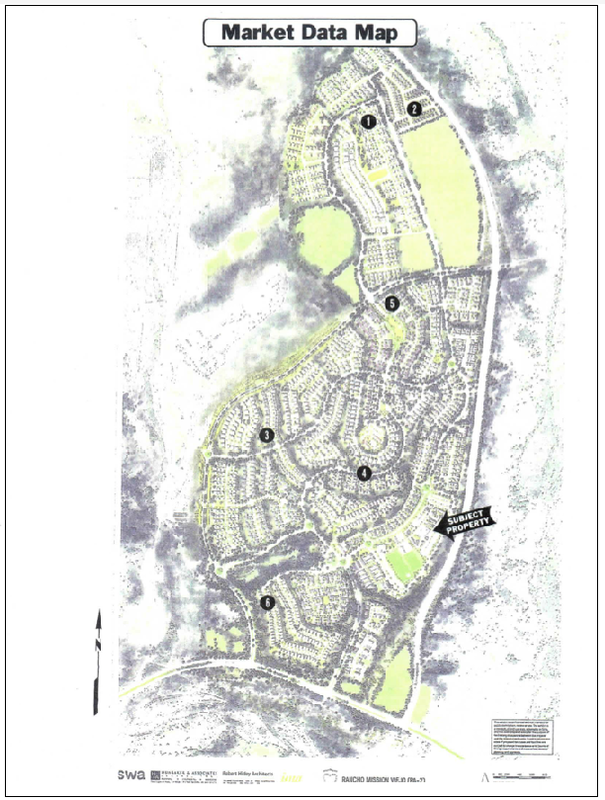 The Board is being asked to approve a purchase price of $33.86 million for 14 acres - $2.42 million per acre. 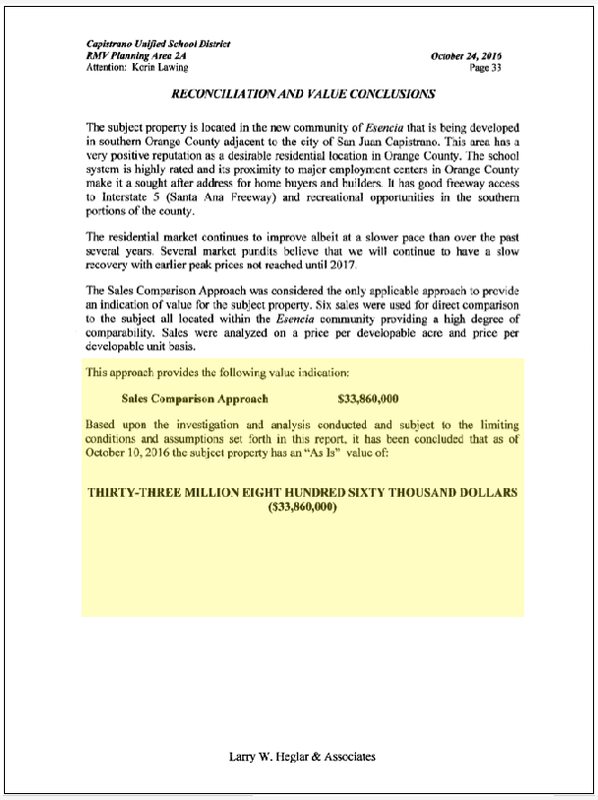 The CUSD Appraisal of this land was completed in October 2016 valuing the land at $33.86 million. Staff did not provide Trustees with an opportunity to review the proposal until the February 22, 2017 Board Meeting. The Item was placed on the CONSENT CALENDAR without a Price. 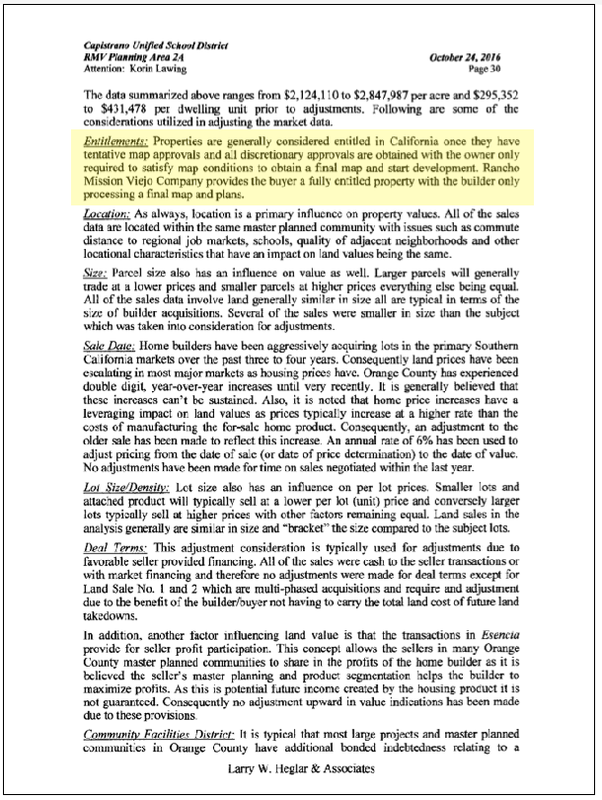 Members of the asked Staff to amend the Item to reflect the sales price. The agreement was signed by Clark Hampton on January 19, 2017 WITHOUT BOARD APPROVAL. The Attorney for CUSD signed the agreement with an X and his signature is unidentifiable. Members of the Public have filed a Complaint with the District Attorney's Real Estate Fraud Division. This is 14 acres of dirt with NO Entitlements attached to the land. The Appraisal valued the land at "Highest and best use" - as if it had 100 homes on it. If this agreement is approved - taxpayers will have been defrauded out of $23 million dollars. The fair market value of dirt without entitlements is believed to be $500 - $800 per acre - $11,000 million dollars. 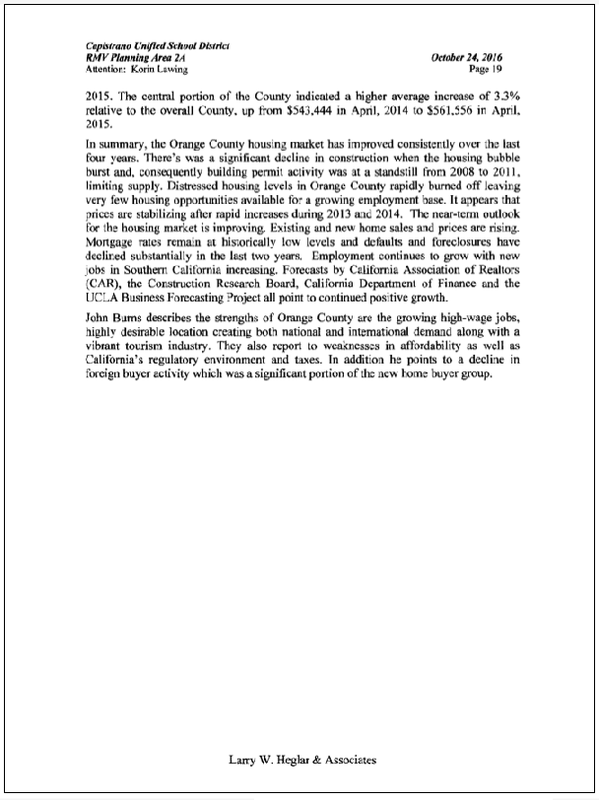 Actual mitigation agreement with student generation rates is grossly unfair to taxpayers. The number of students generated in a 4 bedroom home on a large lot is the same as the number of students generated by a 4 bedroom home on a small lot. 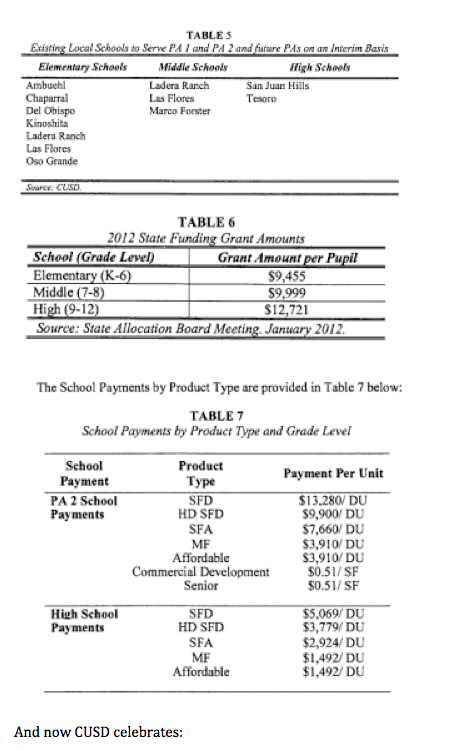 CUSD receives 1/2 the fees based on lot size. 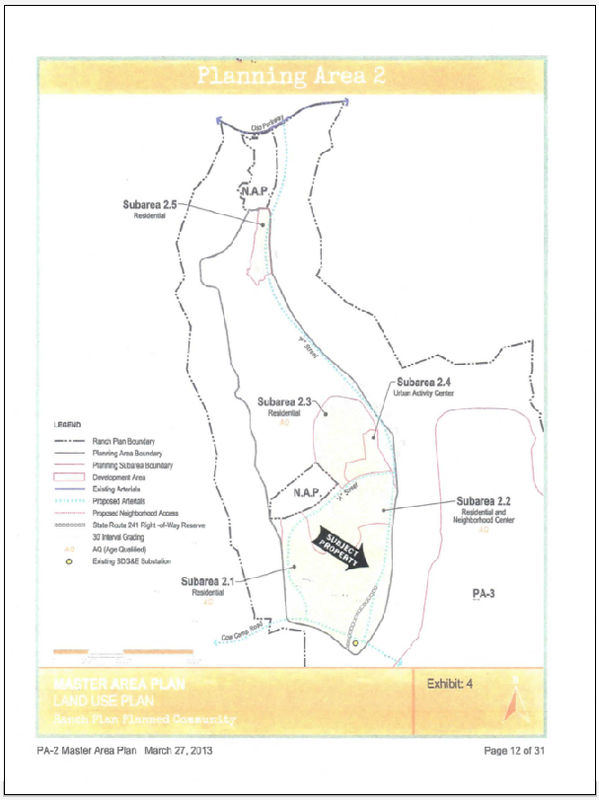 In addition- there is 1,400 more homes that have been built in Esencia and Sendero than the 2013 mitigation agreement projected to be built in Esencia and Sendero. There are going to be thousands of students that will not have a seat in a CUSD school. Very excited about the opening of the school in August 2018. It is very disturbing to be paying Mello Roos and now hear about these delays in the ratification. There is a special culture in Sendero and the culture can change if CUSD does not honor its commitment to build Esencia K-8 by August 2017. 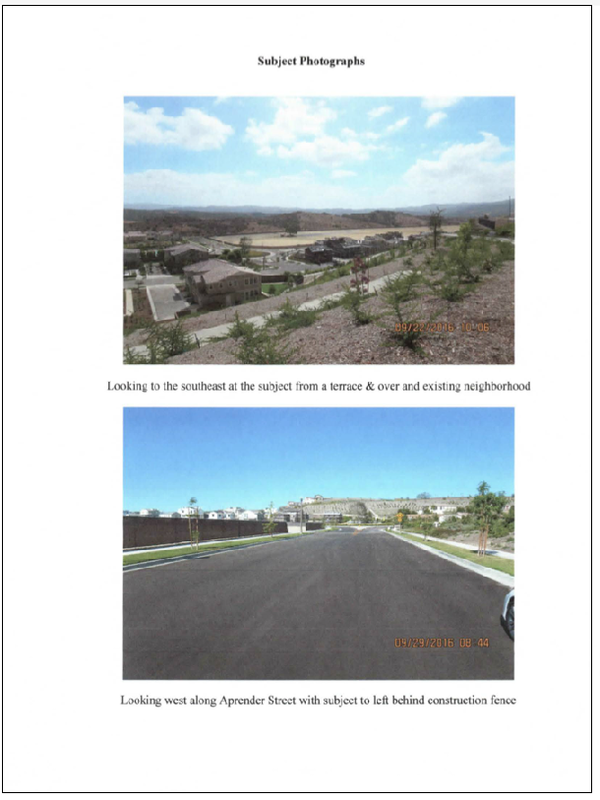 I am very pleased to submit into the record 17 Esencia and Sendero homeowners letters in support of approving this purchase agreement tonight. After speaking with Dianne it is my understanding that a MOU has been reached and that the school will be open on time. I will move the item. I hope that we can get in front of this and get the MOU on line in the next day or two so that the Public will understand what we have done with this agreement. Ryan Burris will post this hopefully by tomorrow so the Public will have some understanding of this. I appreciate the E-mails it sounds like there was some mis-information out there. The delays were not intentional. We have to be fiscally responsible. We went into this with a $21 million dollar estimate and came out with a cost of $34 million. It will not come out of our general fund it is the Mello Roos taxpayers that will pay this. We do not expect the appraisals to show much of a difference, but we will confirm the price that aligns with the 2013 mitigation agreement. 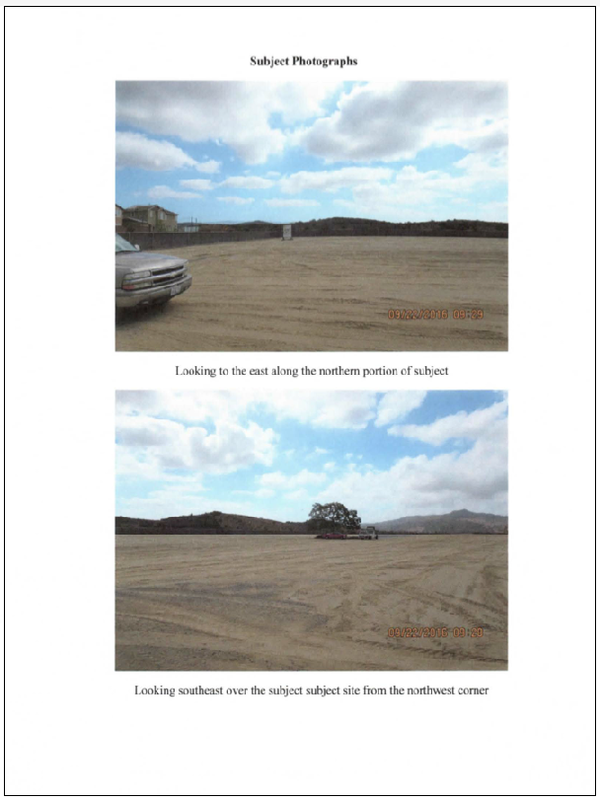 CUSD Staff is asking Trustees to ratify a resolution to purchase the Esencia K-8 School site (vacant land) for $33.86 million when all documentation prior to the resolution stated that the cost of the land would be $21 million. 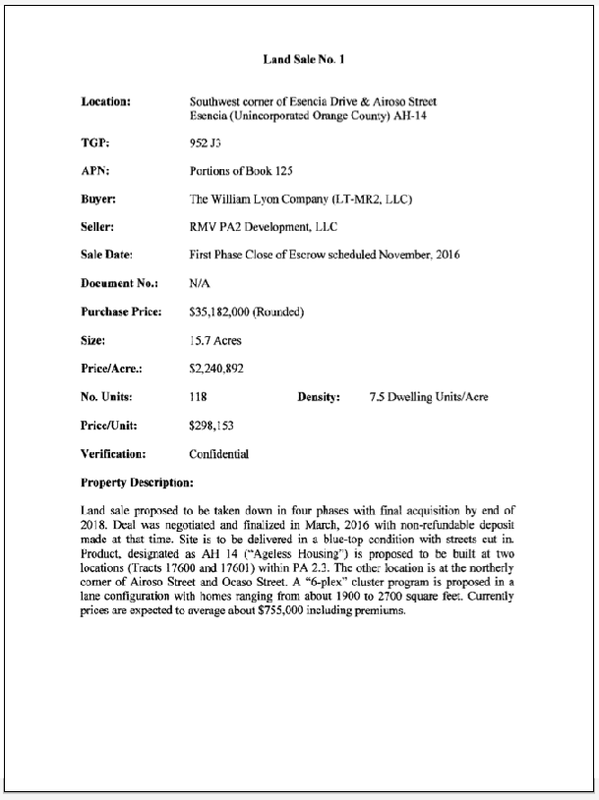 The appraisal was requested by CUSD and was completed on October 10, 2016. Trustees received the Appraisal in February in preparation for the February 22, 2017 BOT meeting vote to approve the purchase for $33.86 million. Staff did not provide Trustees with an opportunity to review the proposal prior to this Board Meeting. Staff could not add the Proposal to the February 22, 2017 BOT meeting due to potential Brown Act violations. 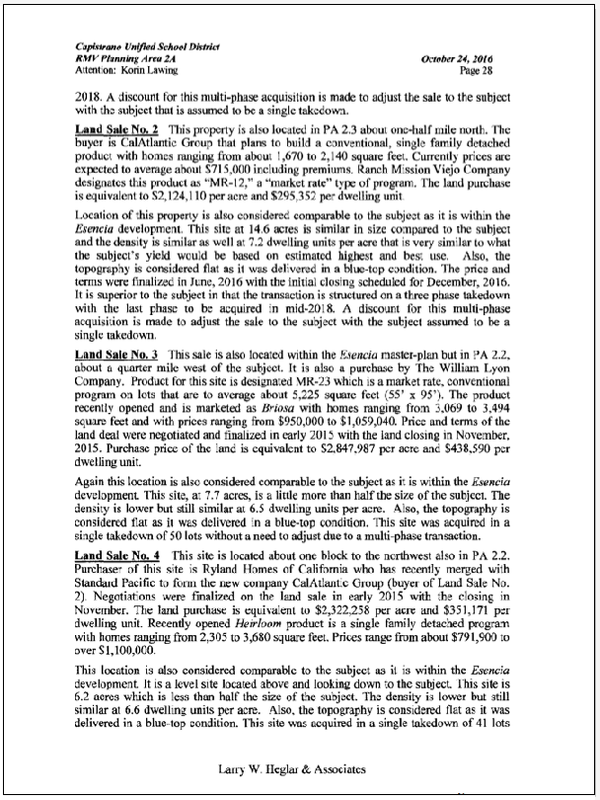 The Appraisal was based on "highest and best use” - the Appraiser valued this vacant lot as if it had 100 dwelling units on it. The Agreement for Purchase and Sale and Escrow PA2 School Site was executed by Clark Hampton on January 19, 2017 without Board Approval. The Attorney for CUSD signed his name with an X and a scribble which is not identifiable. CUSD added a Special Board Meeting on February 22, 2017 to disclose this Item in Closed Session. 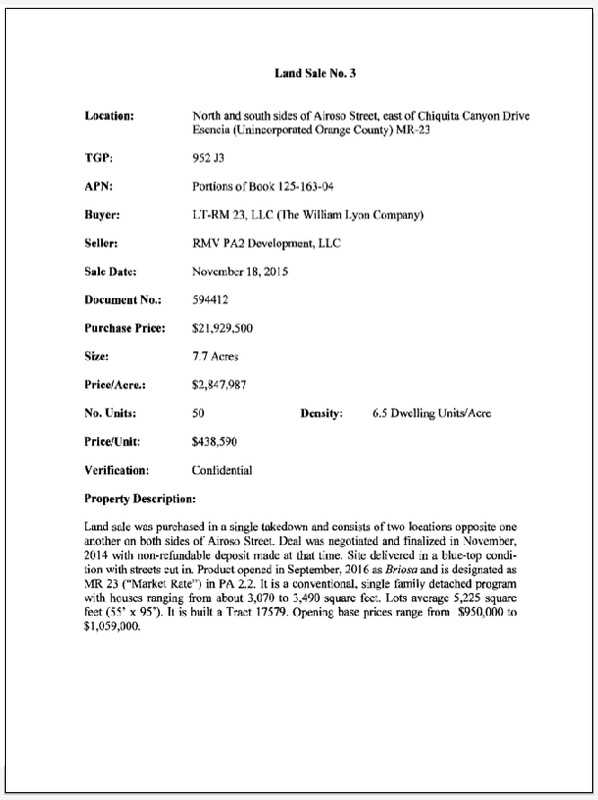 The Item lists Kristen Vital and Clark Hampton as the Agency Negotiators for this purchase. 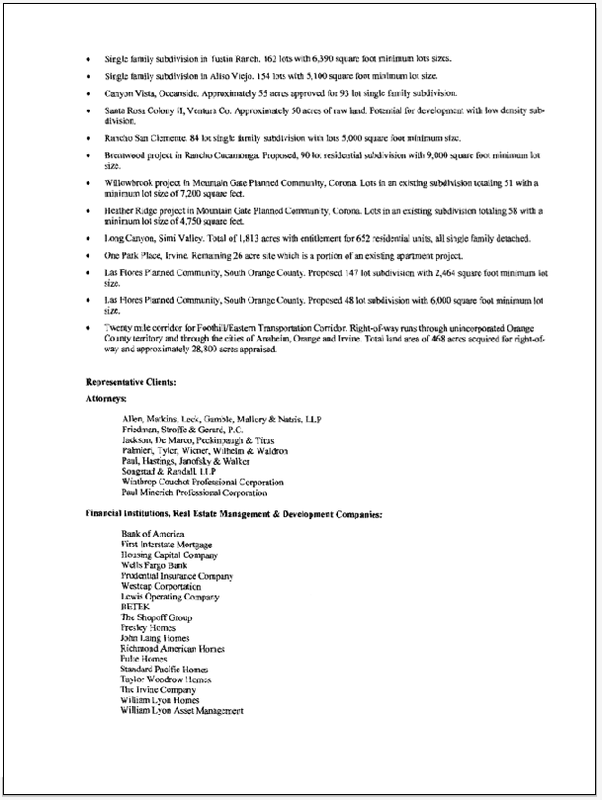 Neither Clark Hampton nor Kristen Vital are licensed real-estate brokers and were not qualified to negotiate this deal. Of Great Concern to the Public is the increasing over capacity of CUSD schools. A March 2016 Capacity study shows that CUSD has 8,555 more students than legal capacity. 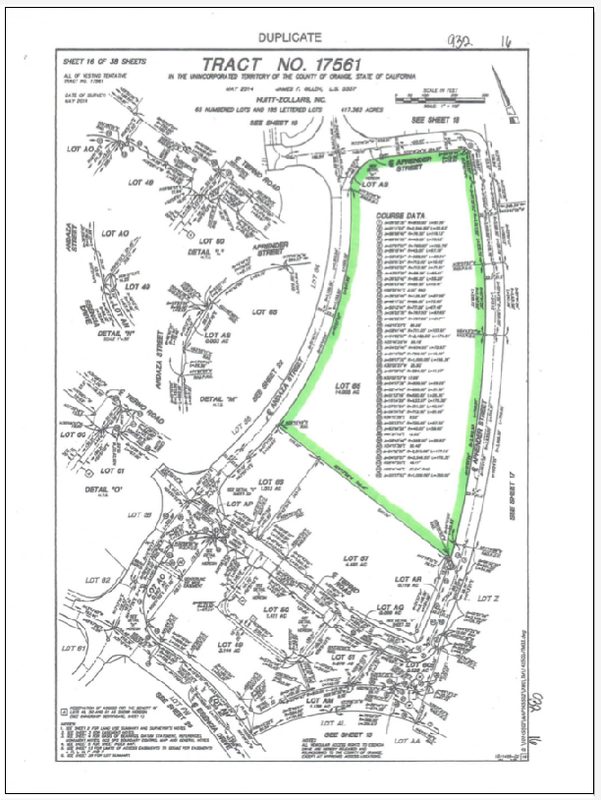 The Public has made several requests to the County of Orange Planning Department to ascertain how many actual building permits have been issued in Planning Area PA1 and PA2 and what type of dwelling units is attached to the permit. It is the Publics fear that well over an additional 1,000 (potentially more) students may not have a seat in our Public school system starting in September 2017. The Ranch is currently paying the District to bus it’s residents to Las Flores K-8 and Tesoro High School giving the Ranch students PRIORITY over Mello Roos taxpayers who have paid for San Juan Hills High School and Las Flores, Tesoro and San Juan Hills High School. Mello Roos taxpayers in both Ladera Ranch and Talega need a legal opinion as to who has priority at these schools - without one there students are being told to go to Cappo Valley High School and San Clemente High School even though their money has pays for Las Flores, Tesoro, San Juan Hills and San Clemente and they should have a choice. 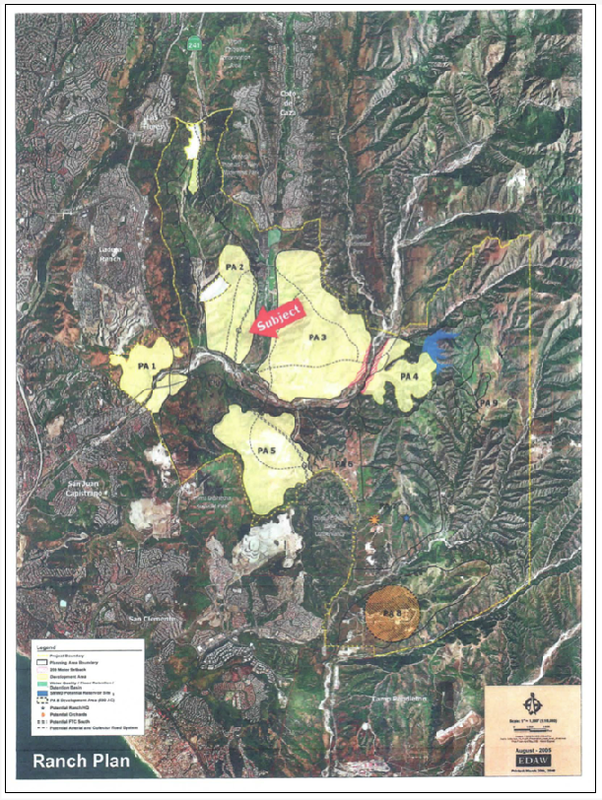 The original 2013 EIR/Negative Declaration allowed the Ranch to build a maximum number of dwelling units in Planning Areas 1-9 of 14,000. The projected time line was 25 - 30 years. The original 2013 EIR/Negative Declaration called for Esencia K-8 to open September 2017. It is still a dirt lot. 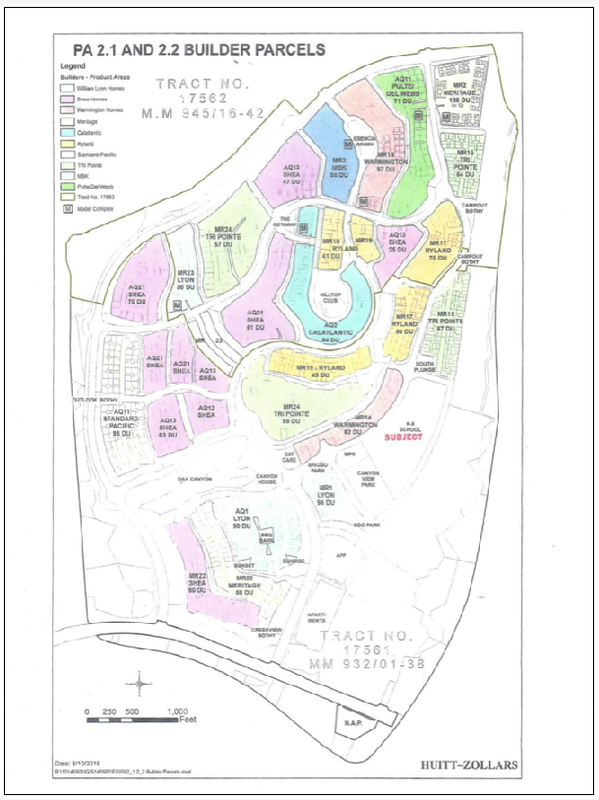 In an addendum the Ranch was given permission to build 264 Affordable housing units (not included in the 14,000 maximum units). It should be noted that the Ranch timeline for build out has been accelerated and the density of units has increase. 4,578 - 3,172 = 1,406 more homes than CUSD planned seats for. 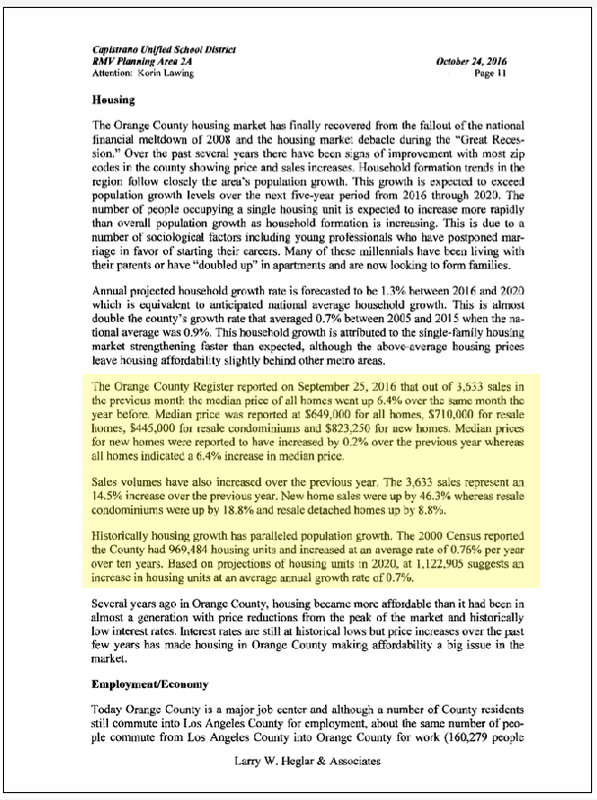 Also of concern is the fact that the student generation rates were suppose to reflect Ladera Ranch. 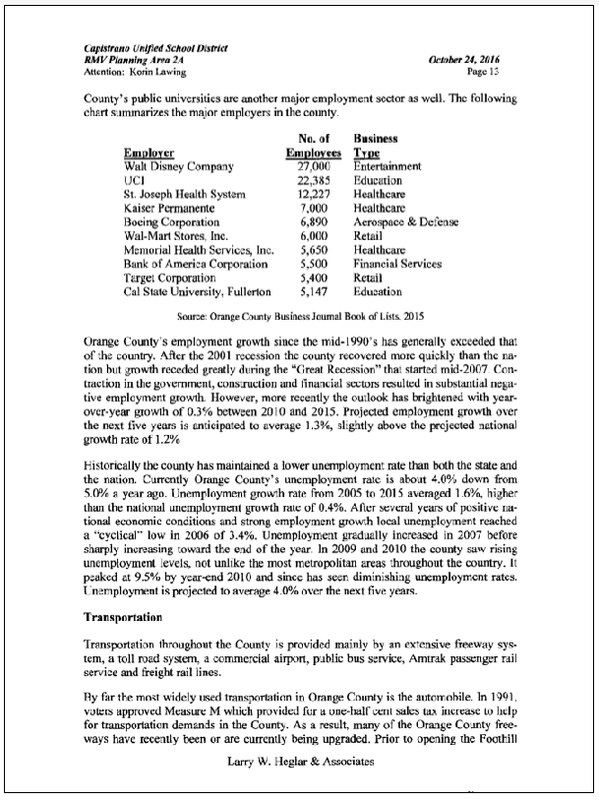 The number used are low because they reflect Orange County as a whole. The bottom line is that we have 6 months to solve the problem of where to put all of these students. The solutions will not come from CUSD. The Public needs the help of elected leaders to solve this problem that will effect the quality of life of every taxpayer in south Orange County. 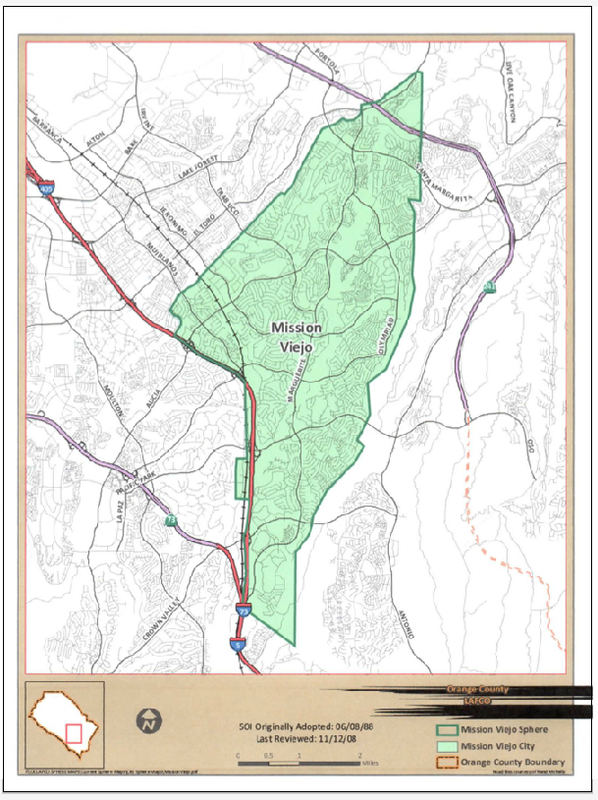 February 22, 2017 Board of Trustees Meeting Agenda Item #10 the Board is being asked to approve Resolution No 1617-56 which allows CUSD to purchase 14 acres of land in Rancho Mission Viejo to build Esencia K-8 School. A request was sent to Clark Hampton, Deputy Superintendent, Business and Support Services asking that the Agenda Item reflect the cost of the land. 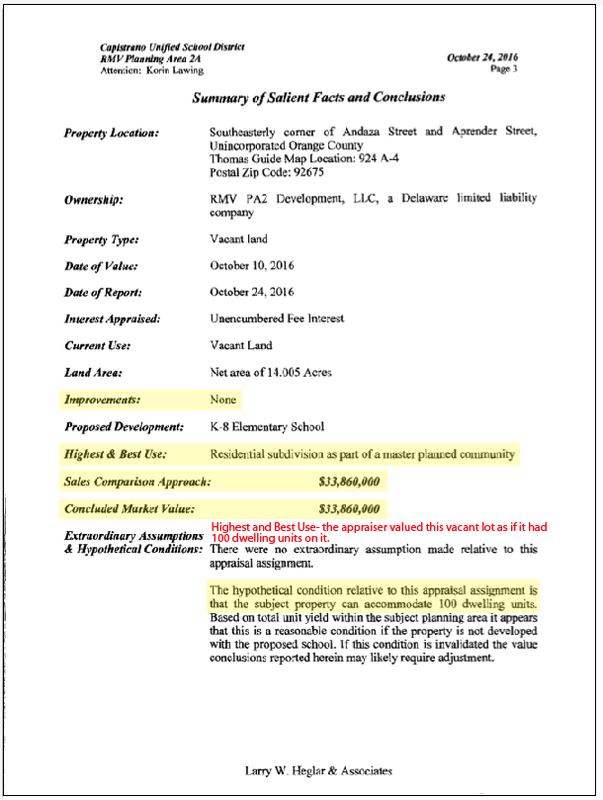 The Item was amended to reflect a cost of $33,860,000 to purchase 14 acres of land for the school site. The original agreement was for 19 Acres of land 4 joint use (15 school acres). The Negative Declaration states that their should be 20 acres of land 4 joint use (16 school acres). 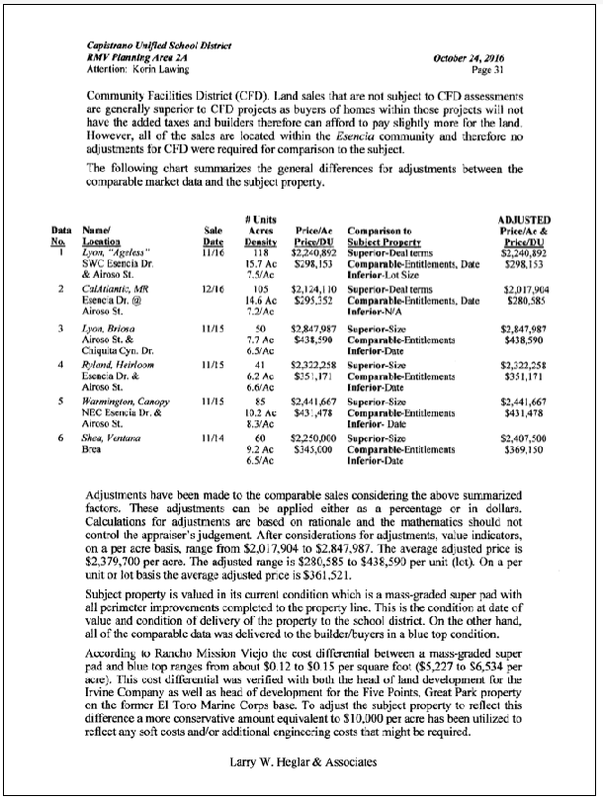 The Board Agenda did not contain the appraisals for the land which would show how the price of the land went from $21 million ($1.5 million per acre) to $34 million (2.4 million per acre). The agreement calls for three appraisals if CUSD does not agree with the first valuation. The Board should not vote to approve this item until the appraisals are made public. They are not included in the Board Agenda so there is no supporting documentation for how the price of the land went from $21 million to $34 million. The Size of the Ranch Development is such that it will be a City of well over 50,000 people when complete. 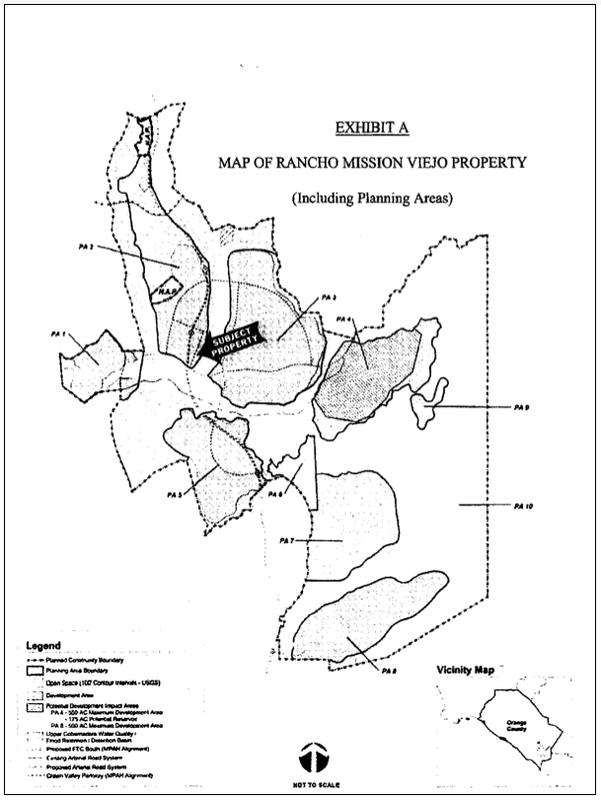 The original EIR dated 2004 approved on 2006 stated that the Rancho Mission Viejo projected 9 development areas with 14,000 dwelling units that would generate 4,288 K-12 students. The build out was projected to take 25 - 30 years. 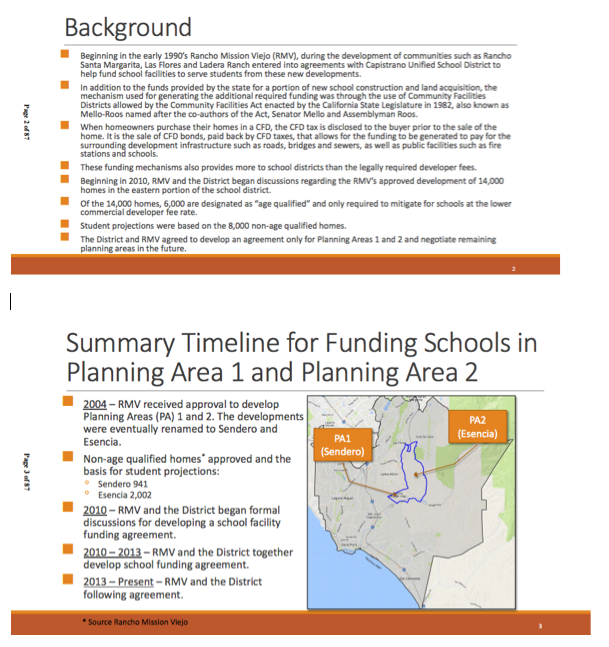 After doing an enrollment and capacity study it was determined that CUSD had no capacity at existing school sites to accommodate ranch students. 1 small high school at 900 students. In March 2016 a new study painted an even worse picture. In March of 2016 CUSD did a "Residential Development School Fee Justification Study which showed that the CUSD's student enrollment exceeded facilities capacity at all school levels in 2015- 16. This report clearly shows that CUSD is in violation of Education Code 17071.10(a) with it's 2015-16 enrollment, without including a single new student from the ranch. CUSD is over capacity by 8,555 students without including any Ranch Development. CUSD should NEVER have agreed to be the school District for RMV Development. CUSD has insufficient funds to provide adequate facilities for its existing students. In recent responses to the Grand Jury recommendation for Asbestos abatement discovered in the 1990's; CUSD responded that it would not be able to abate Asbestos issues due to a lack of funds, and asked the Grand Jury to give the District another 20 years to fix the issues. 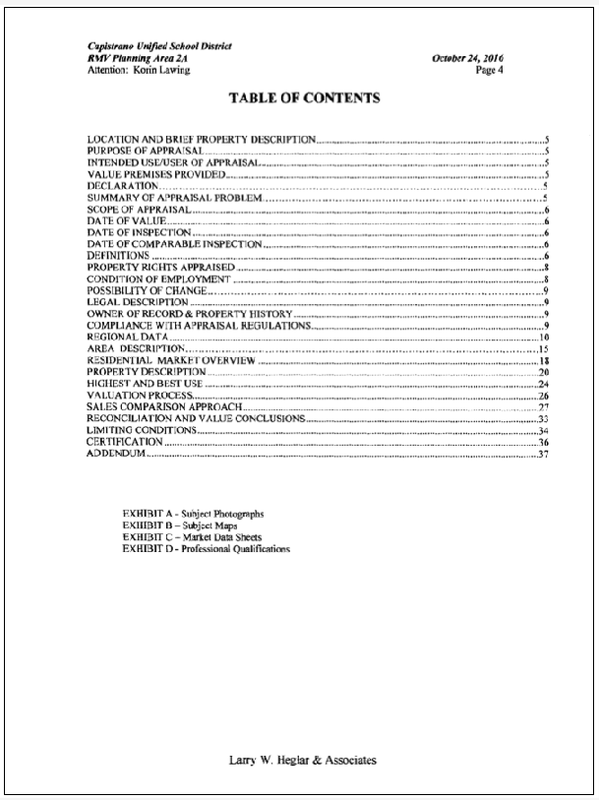 (see: http://cusdwatch.com/index.php/2-uncategorised/123-agenda-item-14-grand-jury-report-and-district-response) for more information. In addition to a lack of existing capacity in CUSD. 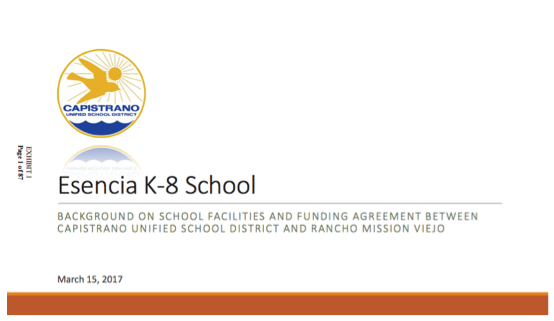 The Ranch has not been a fair partner in ensuring that CUSD could fund and build adequate capacity for new students. The EIR's continually state that the maximum number of dwelling units is to be 14,000 built over a 25 - 30 year time frame. However- the Ranch continues to add dwelling units to Areas 1 and 2 which will make it impossible for CUSD to accommodate a number of students that has been grossly underestimated. No new schools have been built, and the latest 2015 EIR shows that the number of dwelling units in planning Areas 1 and 2 has increased substantially. 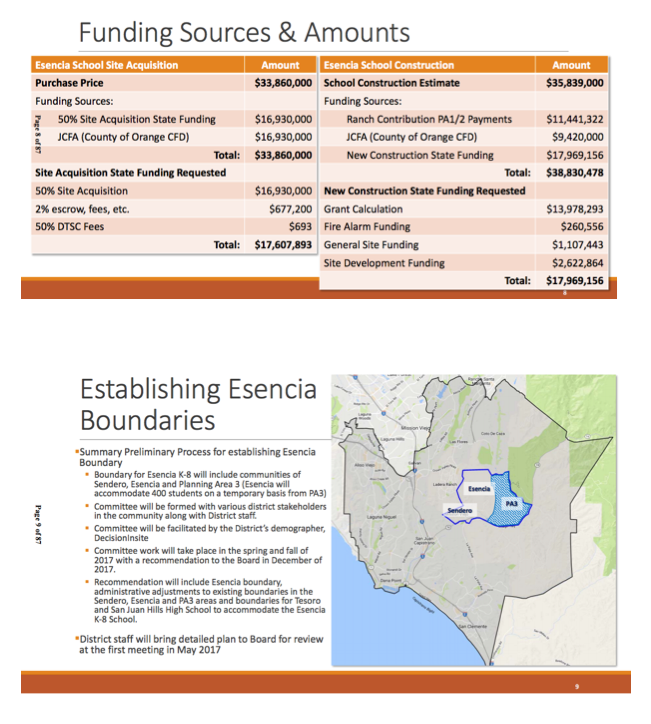 According to the latest EIR Planning Area 1 (Sendero) and Planning Area 2 Escencia of the Ranch Development will be adding 3,987 housing units and there are no schools currently within the Ranch development. 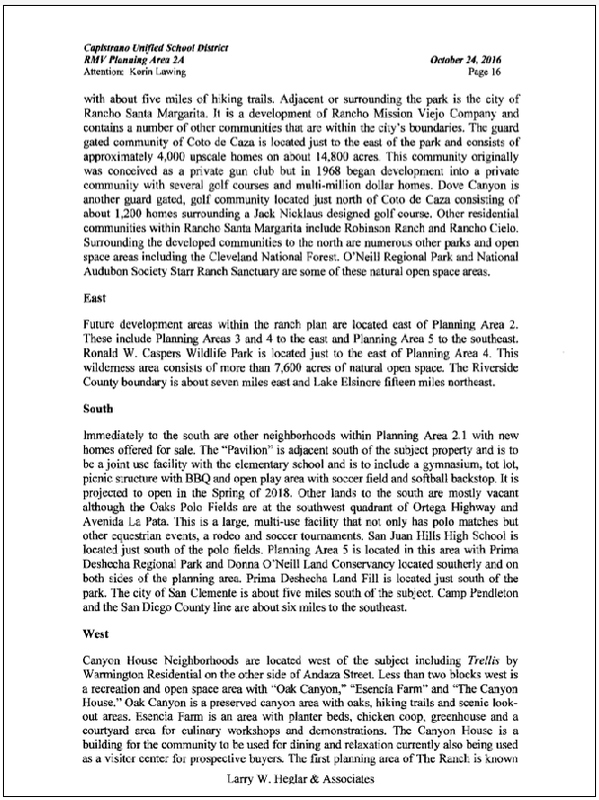 I personally drove to Santa Anna to speak with the County to confirm the number of permitted dwelling units that are in Planning Areas 1 and 2. I am waiting on a response. 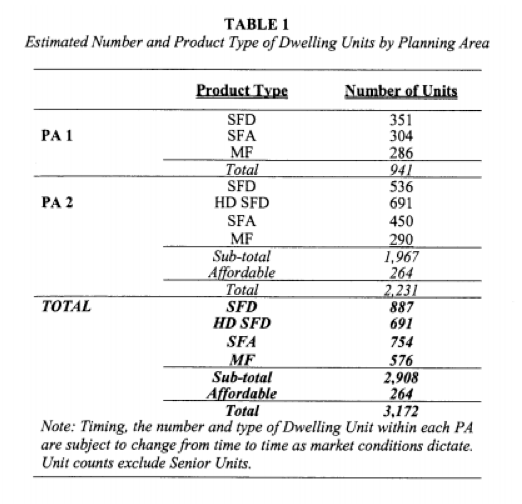 But it looks like RMV has built 1,417 more units in Area 1 and 2 than originally proposed. To add further concern- Addendum's have allowed the Ranch to add "Affordable Housing Units" that are in addition to the 14,000 unit maximum. 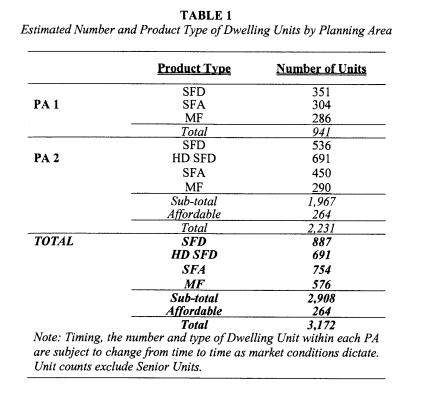 Sub Area 1.4: 175 Age Qualifying units + 12 Home based Business dwelling units. 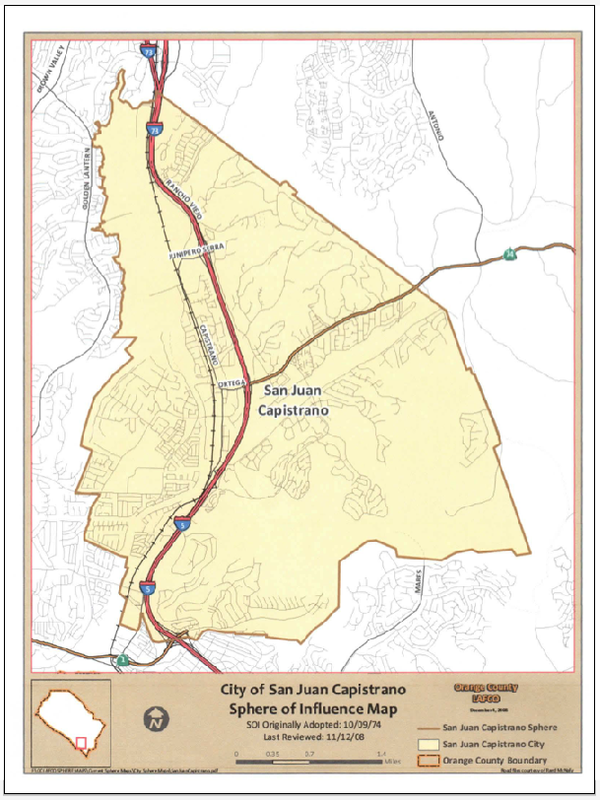 This addendum annexed Plaining Areas 1.3 and 1.5 to the City of San Juan, and it increased the maximum number of units from 1,170 to 1,287 (a 10% increase that was not required to be approved). 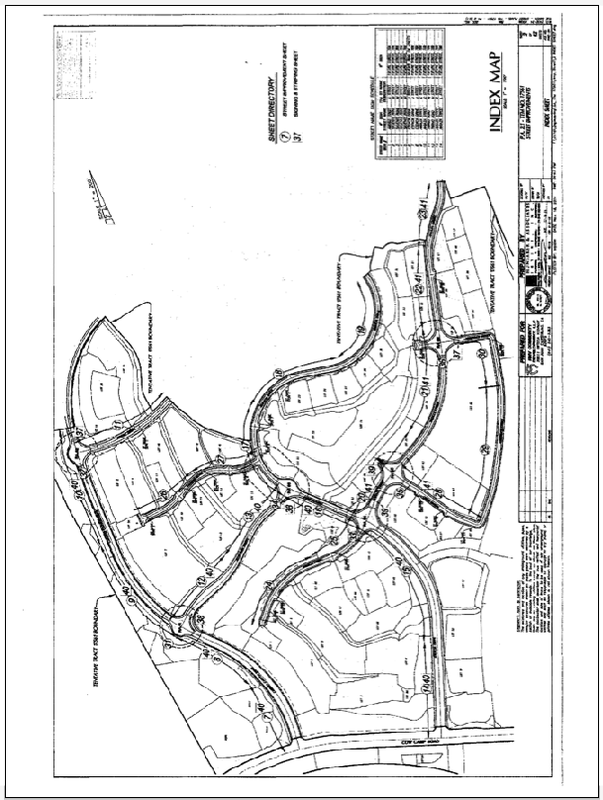 Sub Area 1.4: 300 (up from 175) (100 down from 175 are Age Qualifying units) + 12 Home based Business dwelling units. At This point the build out of Planning Areas 1 and 2 total 4578 units which is 33% of the Total Ranch build out. The original ERI projects a total of 4,288 students at build out so it is reasonable to assume there could be 1,415 students in Planning Areas 1 and 2. Total Units 3,987 That is 1,417 more units than originally anticipated for Planning Area 1 and 2 so CUSD's projection of students is probably low. 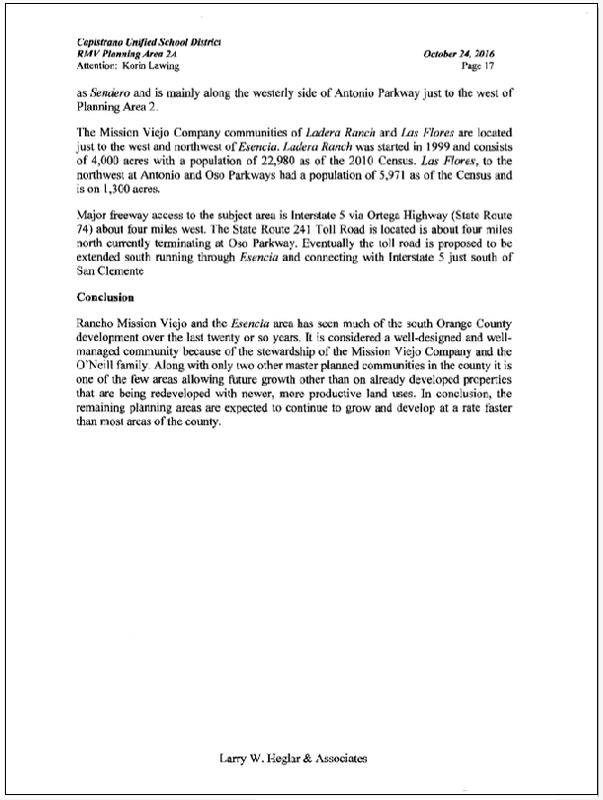 In addition- CUSD used a student generation load factor that is to low- it was suppose to be modeled after the Ladera Ranch Community. This will also make CUSD's projections of the number of students that need seats to low. 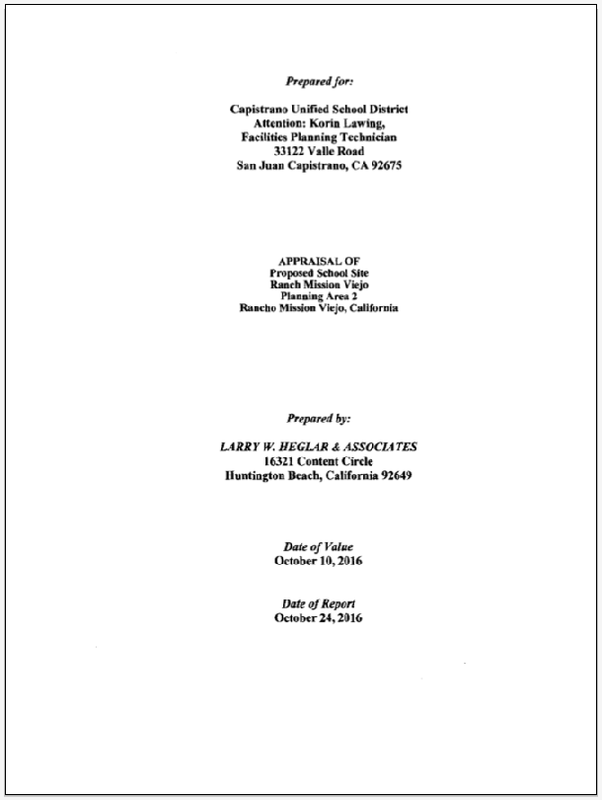 On January 19, 2017 Clark Hampton, Deputy Superintendent of Business and Support Services executed an Agreement for the Purchase and Sale of Escrow Instructions for Planning Area 2 School Site. It appears that Clark Hampton did so without Board approval and without legal review. What attorney signs their name with an "X"? 30 days from January 19, 2017 is Saturday, February 18, 2017 - 4 days before the February 22, 2017 Board Meeting to approve this purchase agreement. The Resolution giving Clark the authority to enter into this agreement has not been executed yet. The contract should be voided because of that alone. 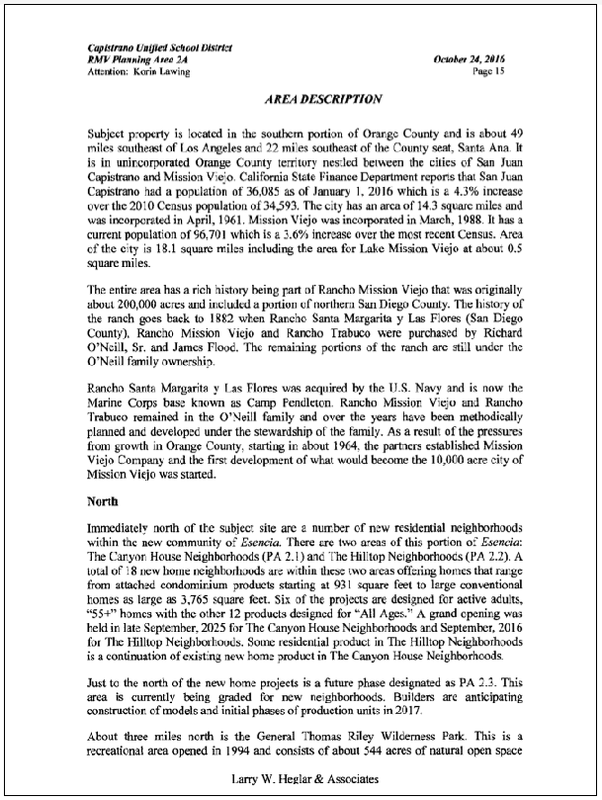 This was compiled by a group of concerned citizens because the County of Orange is not resposnding to Citizen requests for actual building permits approved by type of dwelling in Rancho Mission Viejo Planning Area 1 Sendero and Planning Area 2 Esencia. Citizens personally walked the areas and checked numbers with google maps. *Note- HD SFD are houses that are the same square footage as SFD but they are on 3,000 square foot lots. 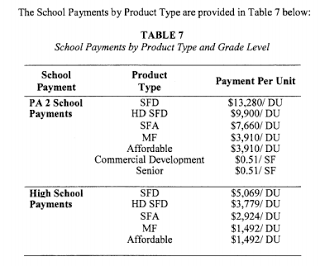 It could be argued that the Ranch should pay the same school payment for HDSFD as they do for SFD. $6,949,760 million in fees should have been collected. $2,287,303 million in fees should have been collected. 79 9-12 students using this formula. What is causing the problem is Esencia. They have increased the number of maximum units and have changed dwelling types to a much higher density. 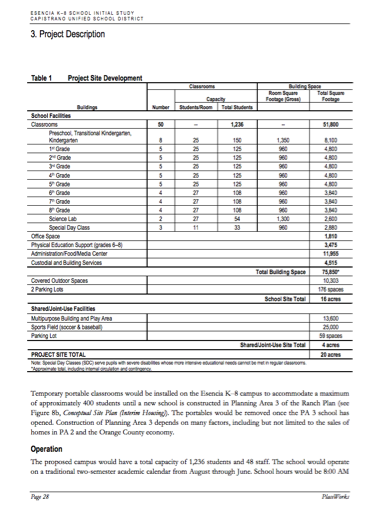 $17,078,760 million in fees should have been collected for Planning Area 2 Phase 1, 2, and 3. If any PA 1/PA2 students require portable classrooms or are required to be bused to schools outside PA1/PA2 RMV agrees to pay $1,587.60 for each student. 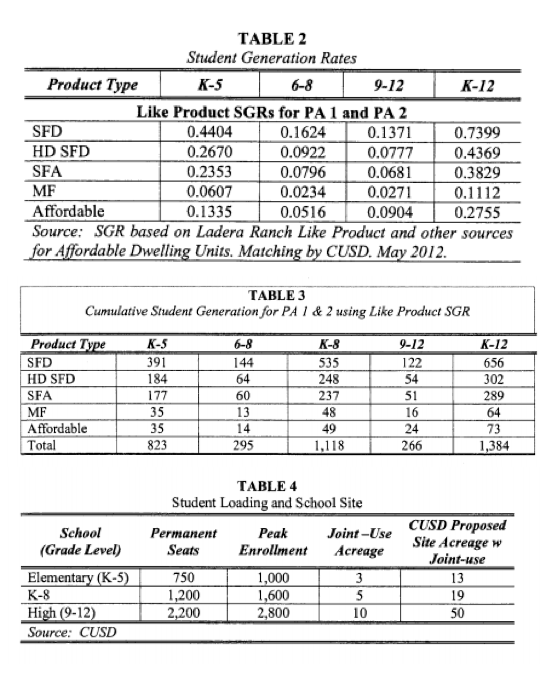 PA 1 and PA2 (Phase 1, 2, 3) are projected to generate 1,119 students by 2018. 147 9-12 students using this formula. The Price of the land must be re-negotiated. The Projected Cost to build Esencia K-8 was $31 million with Fees collected of $32,649,853, the cost to build the school should be covered. The cost of the land was projected to be $21 million. Staff is asking Trustees to approve a purchase price of #34 million. 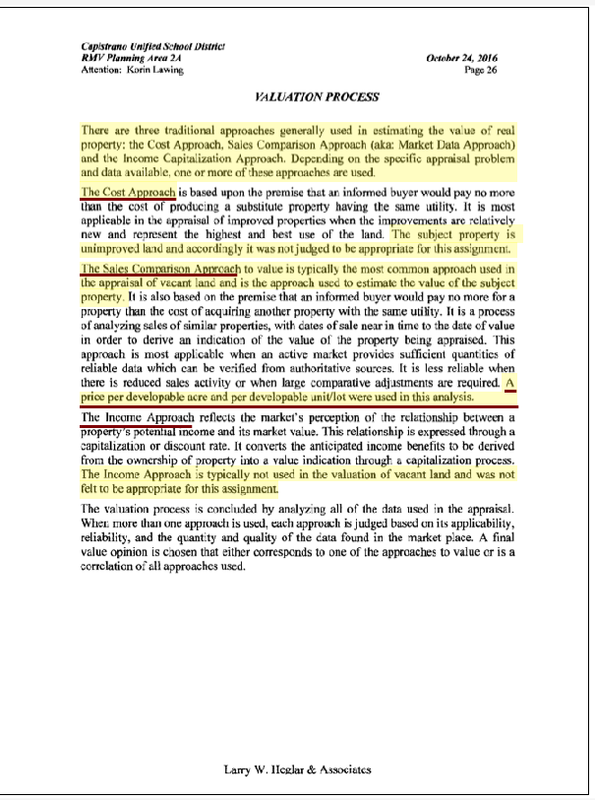 The 2013 Agreement states that this land must be valued at "Highest and Best Use"- without entitlements the land cannot be valued as if it has 100 dwelling units on it. The Purchase Agreement with the land valued at $34 million is unconscionable. 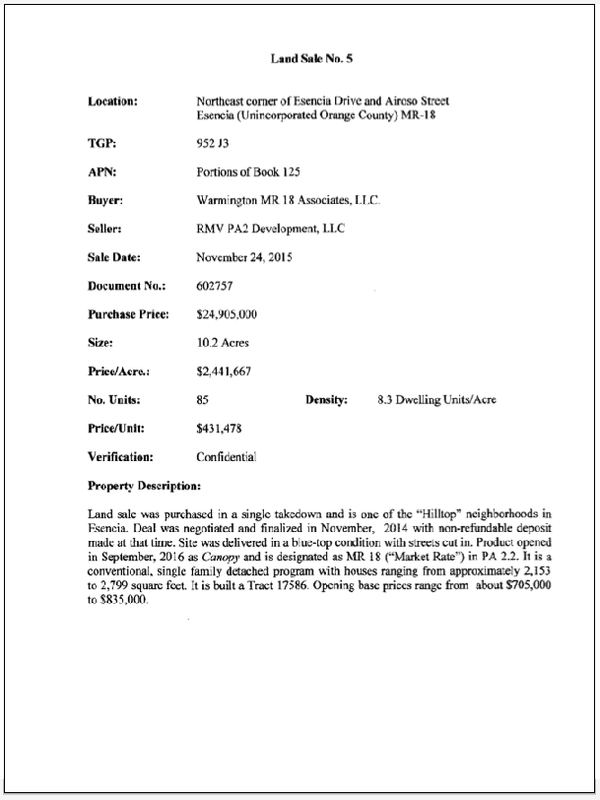 A complaint has been filed with the District Attorney's Real Estate Fraud Division. 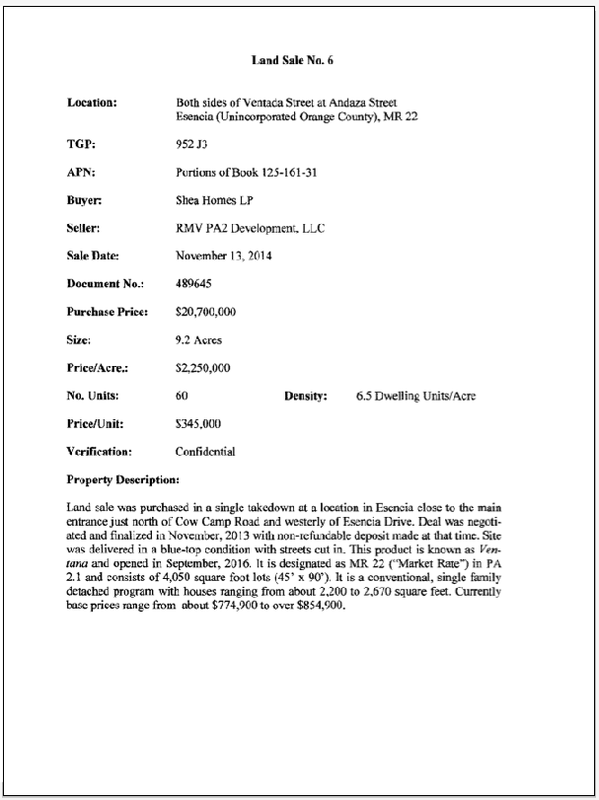 Trustees are urged not to approve the purchase of this land at a price of $34 million. A Special Board meeting regarding this contract for the purchase of Esencia K-8 land was held February 22, 2017. 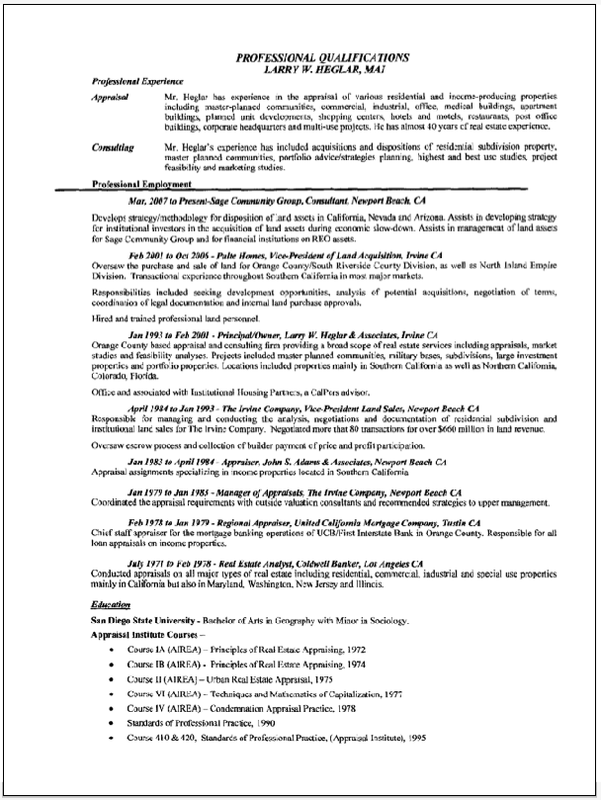 The Item States that the "negotiators" for CUSD are Superintendent Kristen Vital and Deputy Superintendent of Business Services. Neither of these people are licensed real estate brokers, and as such they should not be negotiating a $34 million dollar site acquisition. Clark Hampton signed this agreement on January 19, 2017 WITHOUT BOARD APPROVAL. The Attorney for CUSD signed his name with an X and there is not ability for the Public to identify who the attorney is. It should also be noted that Staff placed the Purchase agreement on the Consent Calendar and did so without disclosing the price to be paid. 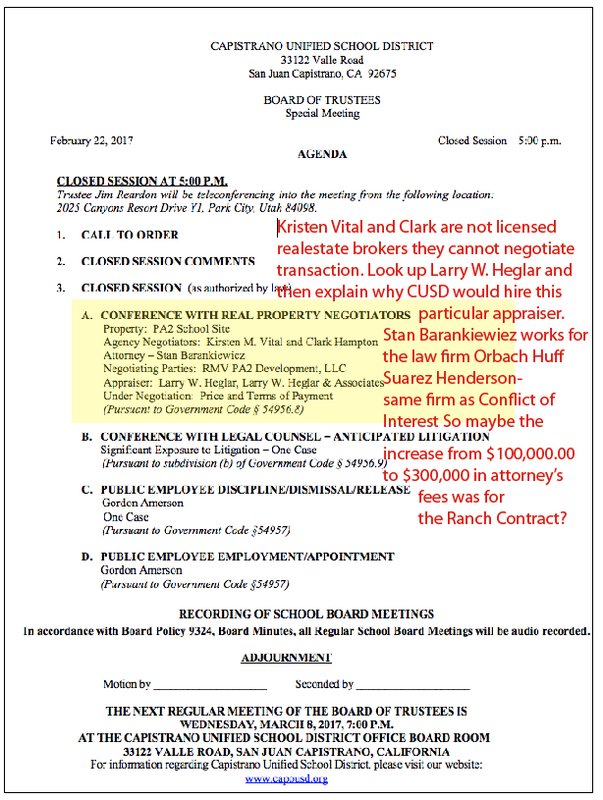 District Staff with Board Approval through CUSD's School of Choice Policy are denying Mello Roos Tax Payers seats at schools they paid for so that students from PA1 and PA2 from the Ranch can have priority. 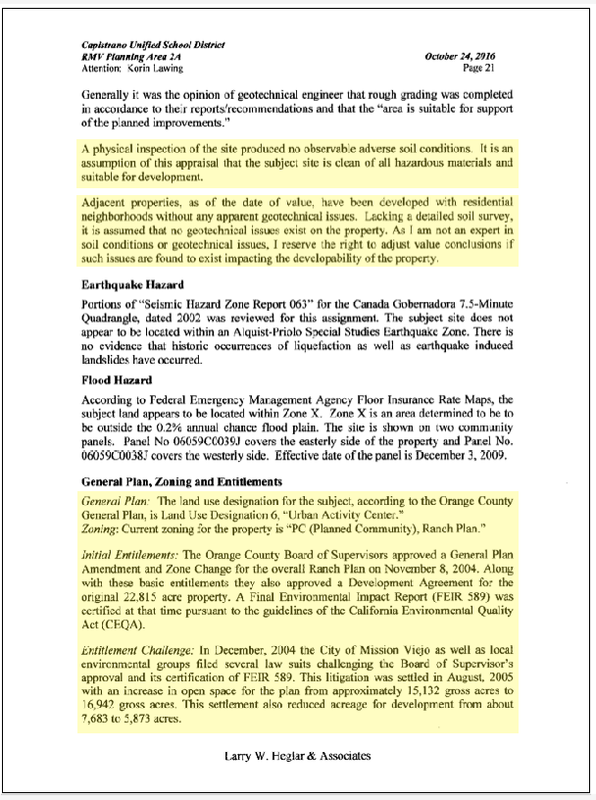 Page 11 of the November 2013 Mitigation Agreement clearly states that a High School Study be done to determine the need for a new high school within Rancho Mission Viejo. It appears that there is a desire on the part of the Ranch and CUSD to avoid spending $200 million for a new High School. It appears that the intent is to eventually place the Ranch students at San Juan Hills High School. page 24 of the agreement requires a study to determine high school facilities requirements. March 2016 Capacity study shows that CUSD is 8,555 students over capacity without the inclusion of any Ranch students. There are no seats for the projected 1,119 students generated by PA1 and PA2.